Mark Smids reports that the Wing Commander movie is being rereleased on DVD on August 2nd... in the Netherlands! Will this version have anything special? Only time will tell - regional releases of the movie have included unique special features in the past, including a 'making of' featurette in Spain and an amazing 3D menu system in Japan. We can also cross our fingers and hope that it's a nice anamorphic transfer... but ultimately the fact is we don't know yet: we'll let you know as soon as someone has a copy in hand. It features the colored American poster artwork rather than the 'blue' version sported by previous northern European versions. You can buy the disc from Dutch e-tailer Bol.com here. 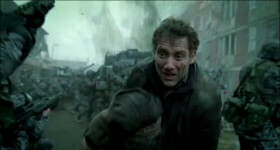 AD noticed that the trailer for Clive Owen's new movie has surfaced on the internet. 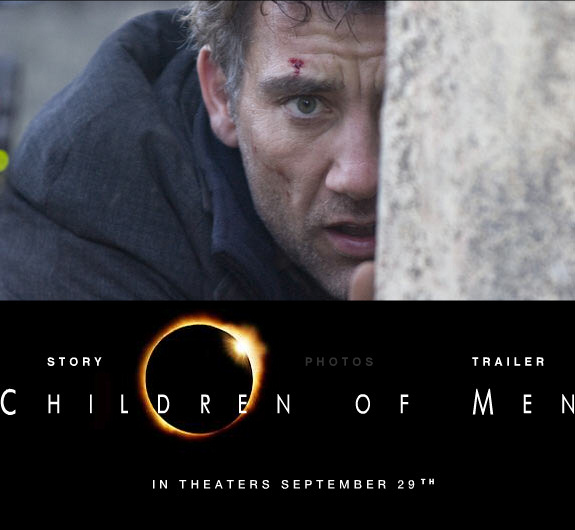 Children of Men caught our eye because its 'eclipse logo' is a bit similar to the European Privateer 2 'eclipse eye' art. That's about where the similarities end, but the new film does play on some science fiction concepts and takes place about two decades in the future. Clive is the main star next to Julianne Moore and Michael Caine. The setting looks pretty neat and this should be yet another cool opportunity to catch one of our favorite privateers in action again. 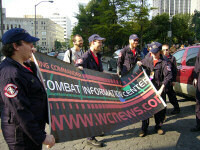 The CIC Eighth Birthday Party is less than two weeks away! We all know that everyone comes for the fun, but we like to sweeten the deal by giving away Wing Commander related birthday presents each year. 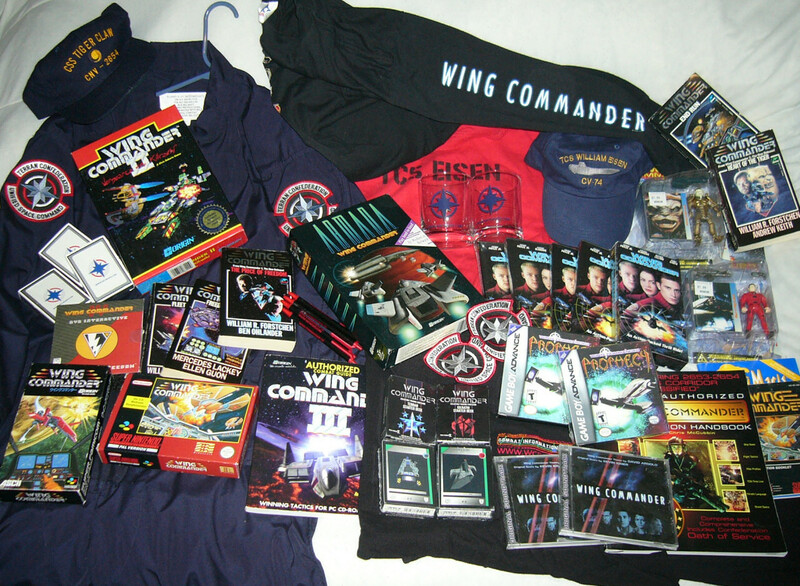 The current prize list includes Wing Commander books, games, DVDs and collectibles and CIC merchandise such as polo shirts, playing cards, Eisen tees, hats and glasses. A custom made Prophecy-style flight suit will go to one lucky attendee, and rare copies of Wing Commander 4 on DVD will also be available. PeteyG has donated several sealed Wing Commander CCG packs, and the Black Lance HQ will also award two party-goers with $25 gift certificates. Everything takes place on Thursday next week. At 7:00 pm Eastern US (4:00 pm Pacific and 11:00 pm GMT) on August 10, everyone begins gathering to count down to our actual anniversary one hour later. We'll be ready to go with a batch of special birthday features available at the website, and you should be there too. 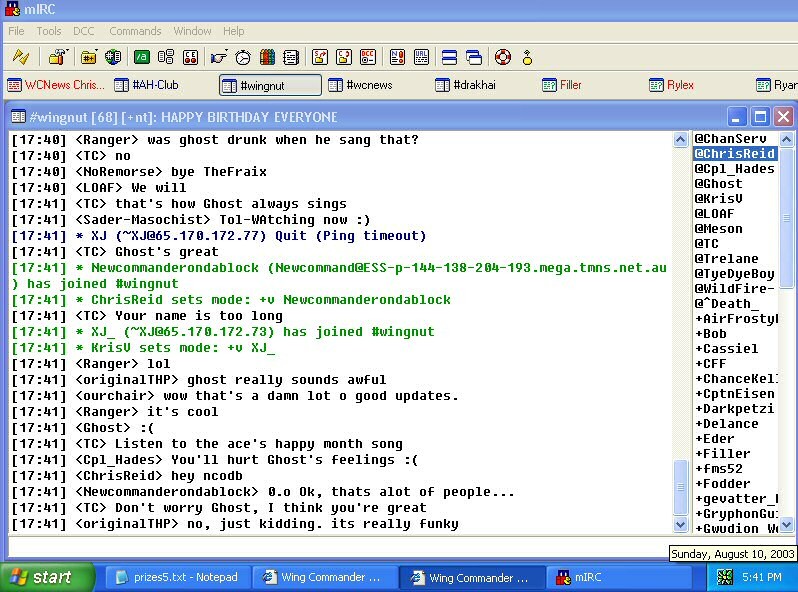 New users can get an introduction to #Wingnut IRC chat via the simple web interface located here. The amazing response to this weekend's release of Queeg's Heart of The Tiger Movie set a new record here at the CIC. The 680 meg file accounted for some 300 gigabytes of bandwidth transferred in just one day on the front page. At its peak, the file pushed out a solid 50 megabits (6 megabytes) per second for a short while. Fortunately there were no adverse effects to the site, and this gave us a good idea of the types of loads we can handle. For those who still need a WC3 fix, the movie is available here. Install the xvid codec if your media player can't automatically handle the file. Feel free to visit Crius.net if you still need help getting the movie to run or would like to provide feedback. Dave Govett, now a policeman, is using his newly found off-hours to fulfill a longtime promise--he'll be reorchestrating Wing Commander on the "good" orchestral libraries. He's re-keying in all the music, rather than using the old MIDI files. If y'all follow his exploits, you'll know he's considered a big hot-shot expert on fake libraries. Hans Zimmer and Cirque de Soleil fly Dave in to help them with theirs. He edited a lot of the libraries that are out there, and wrote a lot of the tutorials, and that's what drove him to police work. Look, here's his email address. Every one of you should hound him to get on the stick and finish this thing off. Encourage him, let him know he's good, that you like his music, bla bla bla. You can read the discussion here. It turns out that George Oldziey, who composed the music for Wing Commander III, IV and Prophecy, lives just a few blocks from The Fatman. Visit the music section if you want to check out their work. After a period of being closed for redesigning, Cyberion and ZFGokuSSJ1's Crusader fansite is back open sporting a new paint job. 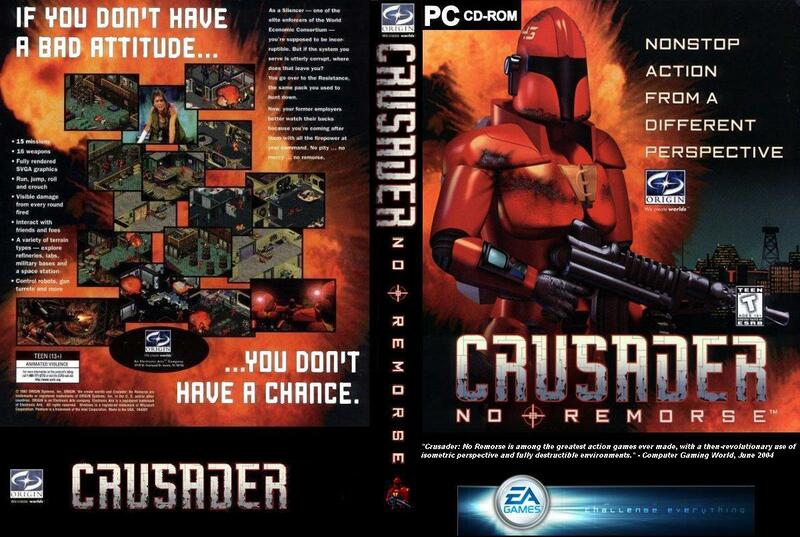 Echo Sector is probably the closest you'll find to the Crusader equivalent of the CIC. The site features news, downloads, and of course forums where you can discuss the news, get tech support, and ask why Boba Fett's armor has turned red. There are also articles and background information so you can find out all you ever needed to know about one of Origin's more underappreciated properties. Heart of The Tiger Movie Released! 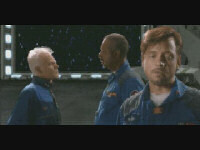 Queeg has managed to turn Wing Commander III into a full length movie. His 'Heart Of The Tiger' Movie Project uses selected video scenes and actual gameplay footage to deliver the complete experience in one neat package. This very impressive effort turned out a whopping two hour & twenty minute final video. Several similar attempts are in the works for different games, but this is the first such project to produce a finished product. You can download it here. At 680MB, this is the largest single file that we are currently hosting. A download manager like Getright is recommended to reliably download something this size, even if you are on broadband. Edit: Make sure you have the xvid codec installed. 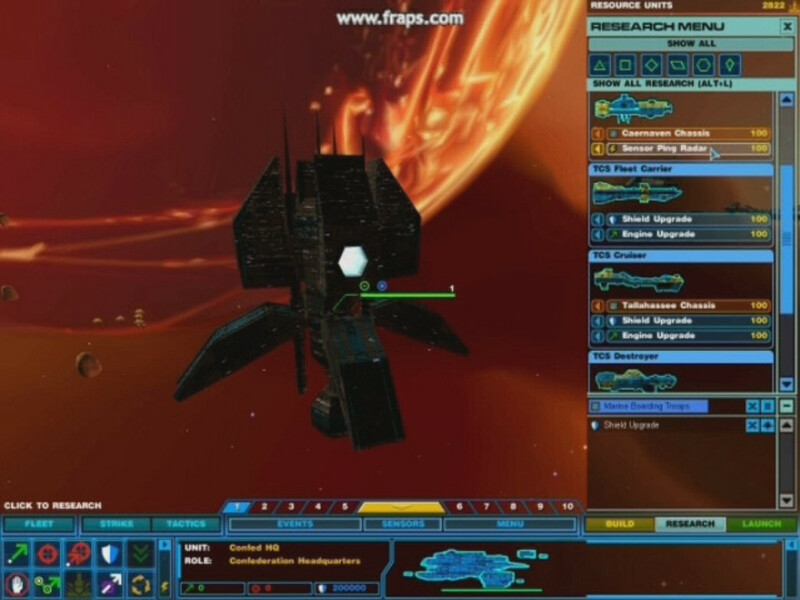 Back in May we reported that ScoobyDoo was working on a standalone model package that adds Wing Commander inspired ships to FreeSpace 2. The pack includes actual WC designs as well as various hybrids and new creations. 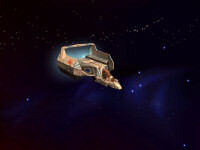 One recent addition is based on the Gilgamesh from Wing Commander 2. 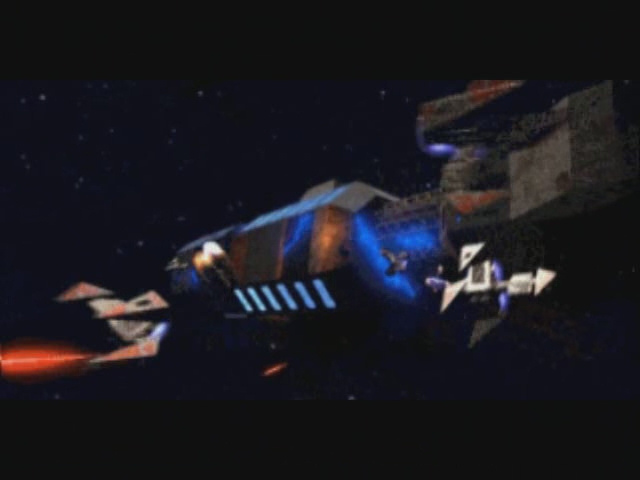 The Gilgamesh was Wing Commander II's answer to the Exeter. Loyal Gilgamesh-class ships, the Hector and the William Tell, followed the Concordia wherever she went. Gilgamesh-class ships were in service than a lot longer than that, though - in fact, 2nd Lt. Blair's first assignment out of Flight School was a 30-hour stint on the TCS Gilgamesh herself. The Gilgamesh is armed with two Flak Cannons and two Anti-Matter Guns. You can download the model here (3MB). ScoobyDoo has also posted instructions on how to use this model in FreeSpace. The final major model for the Confederation faction in Aaron Thomas' WC4 Homeworld 2 mod is now an actual structure in the game. It will get an additional scaffolding/construction attachment so it can serve as a shipyard, but the pictures below give everyone a good look at the design. After the Confed skirmish mode is polished up, the Border Worlds and Black Lance sides will be implemented. A number of UBW/BL ships are already combat ready. Progress is moving along at a good pace, and we're anxious to see what comes next. For those who missed it last week, be sure to check out the gameplay video from the current beta build. Our new poll asks fans to pick an organization that best represents them. Technology-using technophobes can vote for the Retros in the first option. 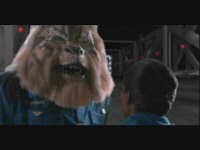 Kilrathi enthusiasts have the Cult of Sivar. 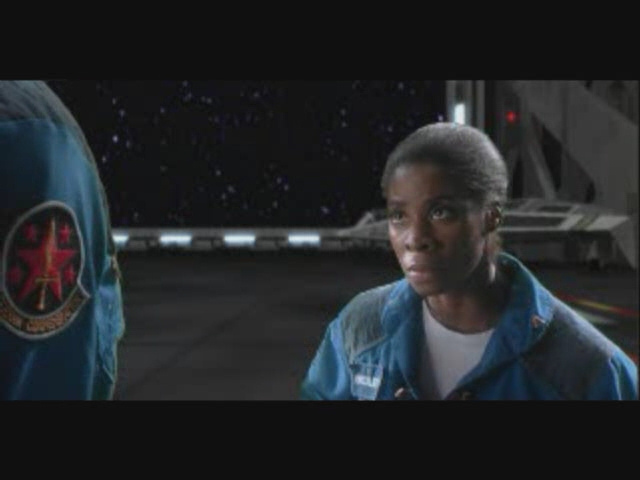 Those concerned with the environment might want to help the Intergalactic EPA clean up Veratek. Business people can decide whether they're more of a merchant or a mercenary. Shady CIC visitors might want to vote for the Mandarins, and last, but not least, our ever-ready fighter pilots can vote for the SRA. The old poll got everyone thinking about their favorite launch scenes. 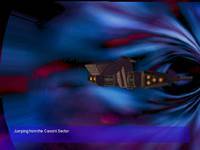 Wing Commander 1's classic dash from the briefing room was a very popular choice (download the scramble mp3 here). Cinematic cutscenes that found creative ways to drop you in space also received strong support. 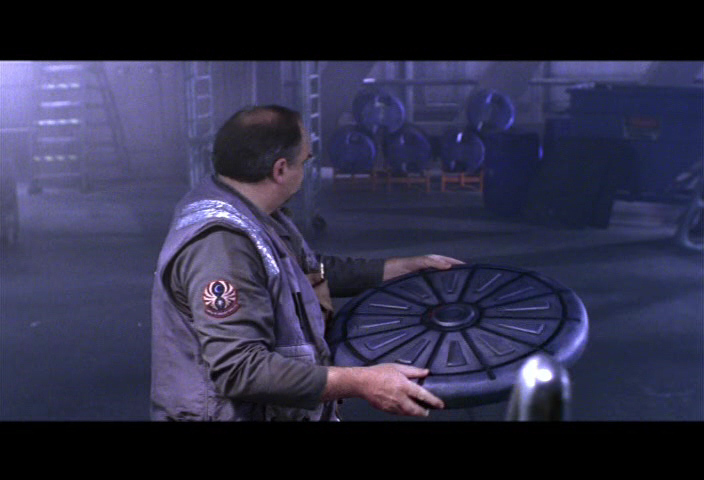 I thought Prophecy's crane on rails was pretty neat, but it lost out to Mark Hamill scrambling down the ready room stairs on the Victory. Poor Academy's holodeck got the least love. 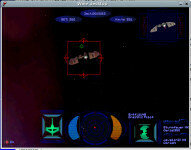 BES continues to work on his Wing Commander mod for Bridge Commander. 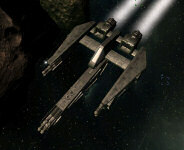 The latest update includes a number of new capital ships for the game. 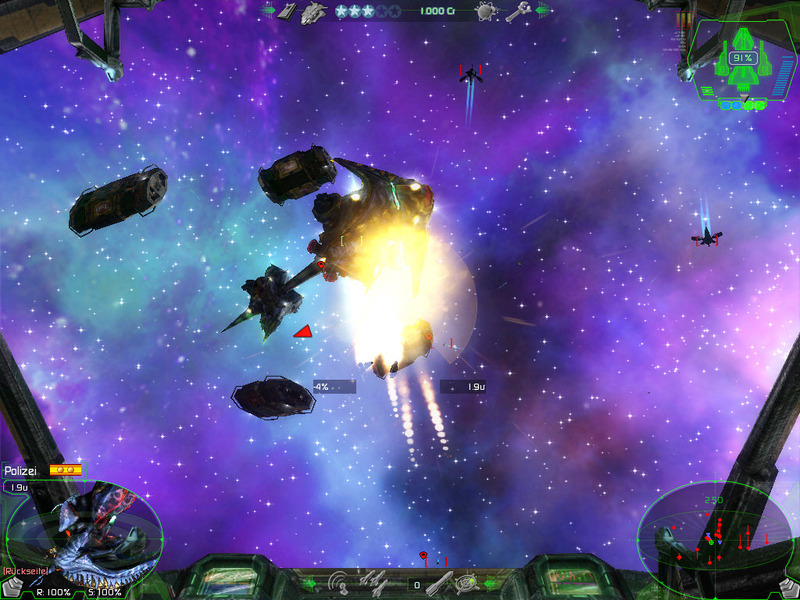 Screenshots below feature some Kilrathi cruisers taking aim on a Confederation Behemoth and then getting caught in the fire from its massive cannon. I'm still not quite sure how such a gigantic thing lines up to hit a mobile target. Only a few WC3-era ships remain unfinished, so a new beta release should be available soon. 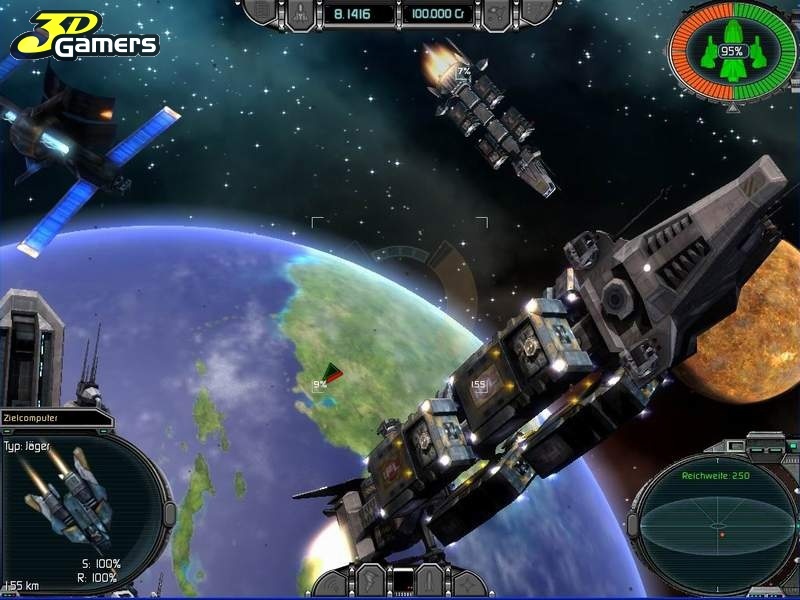 Bridge Commander owners can try the first test here. 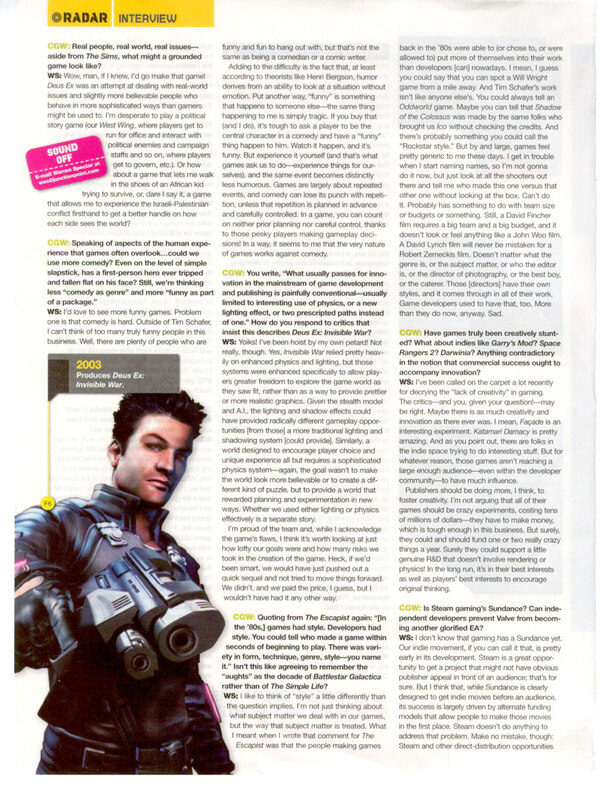 Benjamin Dunham was reading the new issue of GamesTM and found a cute little Wing Commander mention. I'm not too sure why a gaming magazine from the UK cares about Jack Thompson at all, but I do know quite a few people that have quoted Wing Commander in class at one point or another. Jack Thompson has been called many things by anti-censorship campaigners, the gaming press and gamers themselves. He has become the father who thundered that videogames were evil, the school teacher who confiscated your gameboy, the bully who pounded you for quoting Wing Commander in class. In the video game industry, no man is more reviled. Now who can claim to have quoted Wing Commander while having their Prophecy Advance confiscated? It's only about a month now until the CIC staff and friends pack up and head down to Atlanta for our sixth annual DragonCon meet-up. 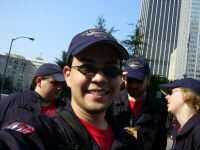 Everyone is anxious to celebrate the Wing Commander franchise in person and represent our squadron in the famous parade. The crew is also picking out their WC CCG decks, tweaking their Armada strategies and exercising their thumbs. To extend the experience, some of the attendees will also be visiting the Origin Museum and Georgia Aquarium on the way down. New additions to DC's guest list include science fiction actors such as David Ankrum (Wedge Antilles) and Jason Carter (Babylon 5), and the convention has even added a number of real scientists to host panels on topics such as civilian commercial space flight. While most of us are out traveling, Kris will hold down the fort here, but stay tuned for daily updates from our Mobile CIC Headquarters once things get going. If you'll be near Atlanta during Labor Day weekend in the US, let us know! 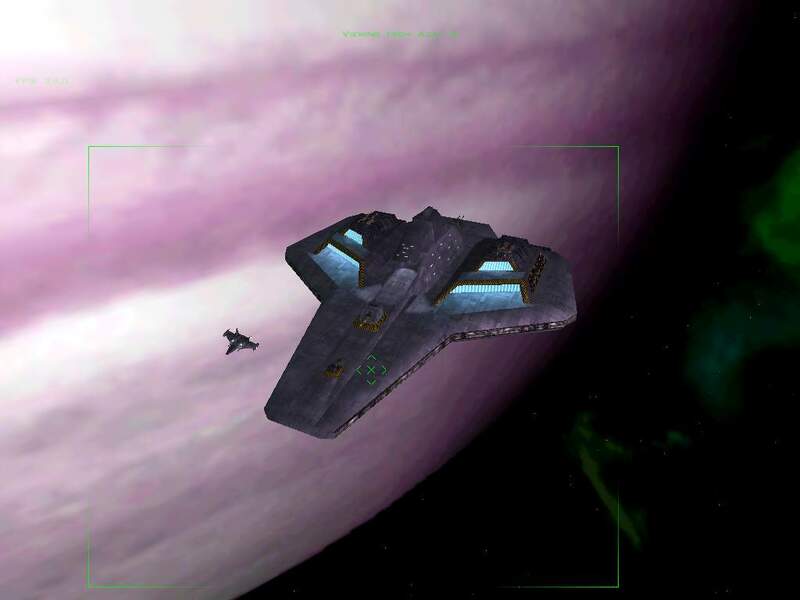 Game Design writer Ernest Adams takes a long look at interactive storytelling in videogames for Next Generation and points to Wing Commander 3's branching storyline as a good example. Readers with an interest in game design or storytelling can find the lengthy article here. Branching stories. In these, the player's decisions, or sometimes his skill at overcoming challenges, determines how the plot line branches. The more frequently this occurs, and the more options he has at each branch point, the more material the designer has to create. The story can have multiple endings. 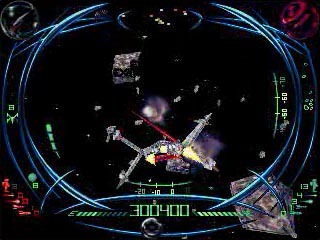 The classic example was Wing Commander III, a large-granularity game whose plot lines branched depending on how well you did at the combat missions you flew. 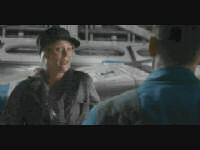 Now that we present video using the game engine rather than filmed actors, dialog is inexpensive to create. If we continue to research things like facial expression animation and body language, we’ll be able to do this kind of thing quite well. "We don't own this place.. but we have an understanding with the people who do!" 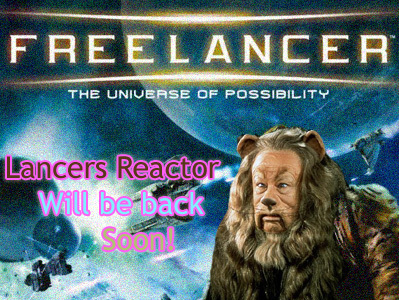 For any stragglers still out there, the Lancers Reactor is online again. 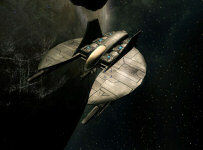 Canaris let us know about a neat ship pack for X3 Reunion that includes a couple of popular Wing Commander designs. 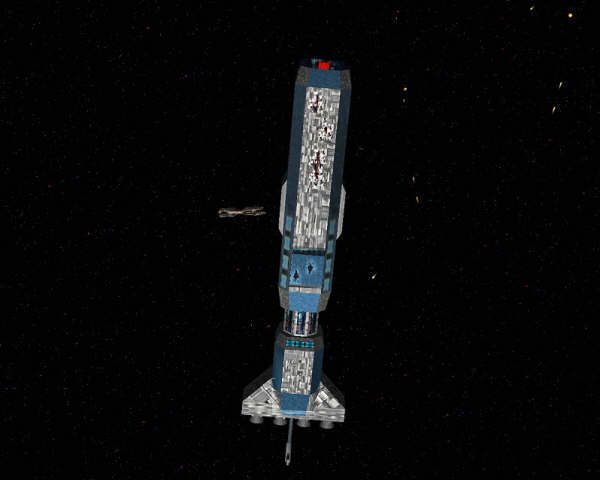 In addition to a ton of models from franchises such as Star Wars, Battlestar Galactica and Firefly, the famous Dralthi and Banshee fighters make their debut in the X3 engine here. 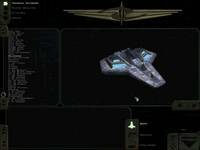 DeadlyDa's "Deadly Ship & Station Mod" includes almost 40 other ships, a few special space stations, helpful scripts and other tweaks. The latest release of the project requires the X3 version 1.4 patch or higher. Fans can grab the 17 meg file here, and check out the Egosoft Forums for information on future developments. 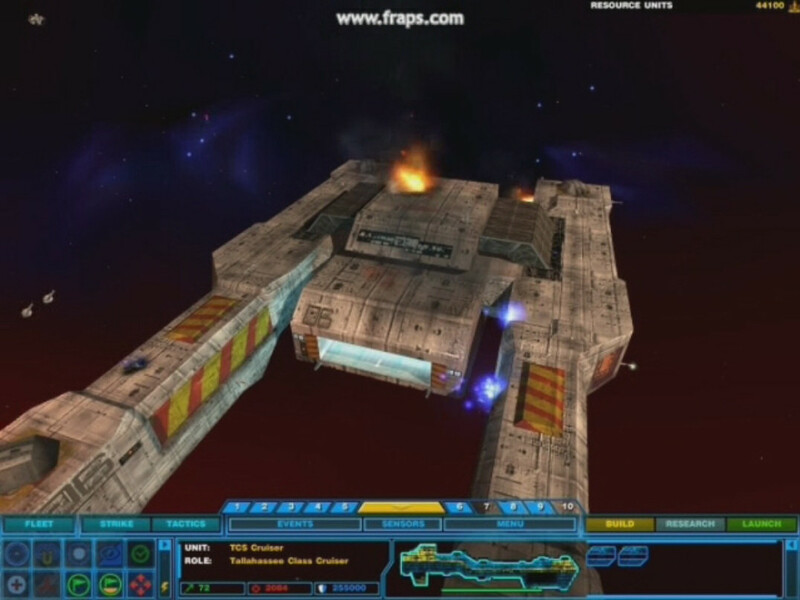 In related news, meisdavidp reports that space sims X2 The Threat and X3 Reunion have been added to the Steam online content delivery service. Both games seemed to do relatively well in the struggling space sim market, and this should give them a nice boost in sales. The games are available for very cheap prices, and this highly visible exposure will hopefully give some traditionally non-simming gamers a great opportunity to get into the genre. For the next few days, the games are also offered at a 10% discount. And as an added bonus, X3 on Steam even ditches the controversial Starforce copy protection which has been in the news this year. 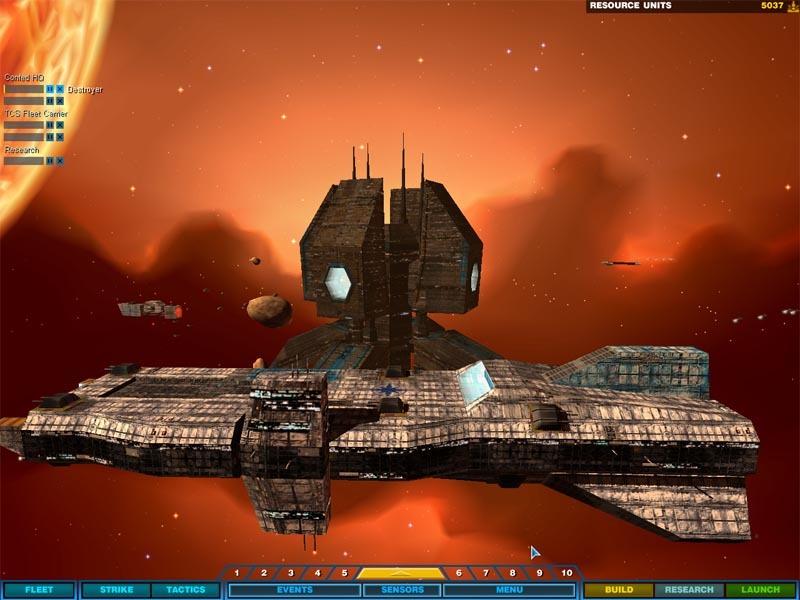 The space game X3: Reunion and its predecessor X2: The Threat are now available via Steam. Regularly $19.95 and $14.95 respectively, they are being offered with an additional 10% discount during their first week of release. 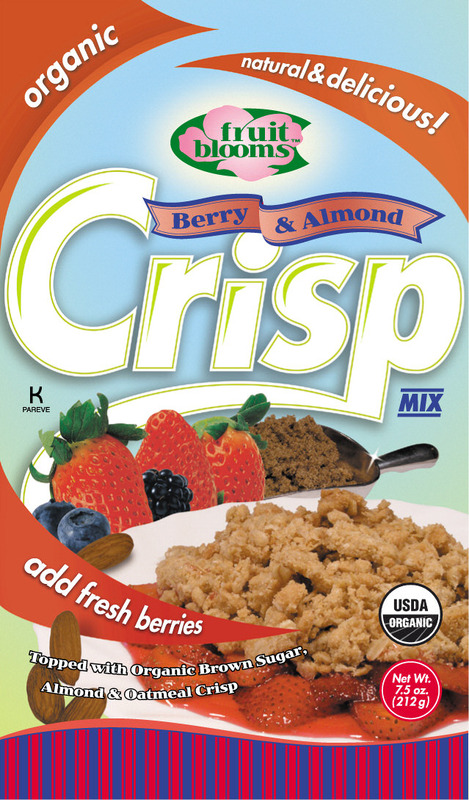 Both feature lush graphics and have been called the best in class by several publications. EA's own delivery service, EA Downloader, is slowly increasing its games library as well. Although they don't currently feature any space combat sims, EA's partnership with GameTap will bring at one classic Wing Commander game online soon. Major Striker has created another animation using his favorite Raptor model. This time a mean old Krant also makes an appearance, but this actually isn't the first time these two foes have met. The two fighters battle to the death in explosive combat. After all the laser blasts and missile trails have cleared the sky, which one is left standing? You'll have to watch the video to find out. The exciting background music track was created by Felagund. 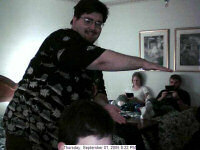 Check out the 33 meg wmv here. Dialup users can try the 7 meg lower quality clip. This past week Farnborough in Hampshire, UK has played host to an international air show displaying the finest creations of aviation. 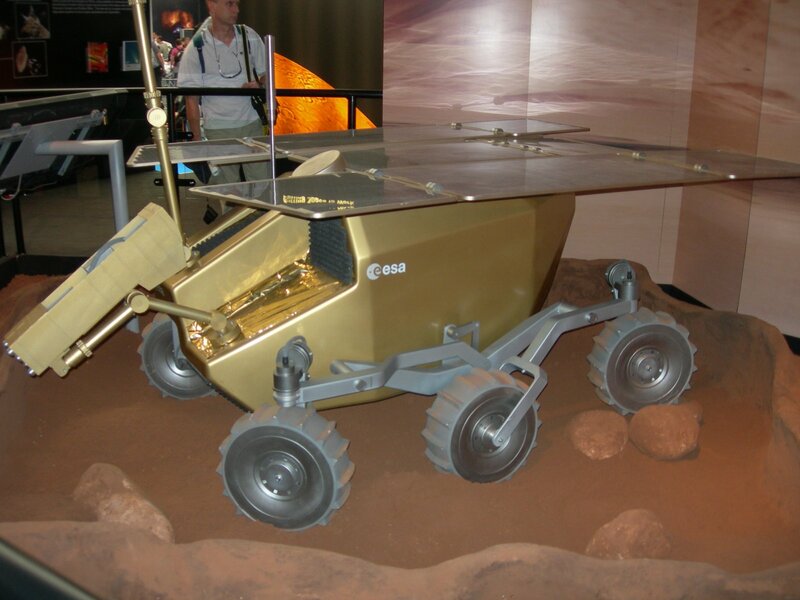 There was also a small section of the show dedicated to developments in space technology including a Vulcain II engine from an Ariane launcher, a full scale Eurostar 3000 satellite model, and the European Space Agency's Mars rover (pictured below). 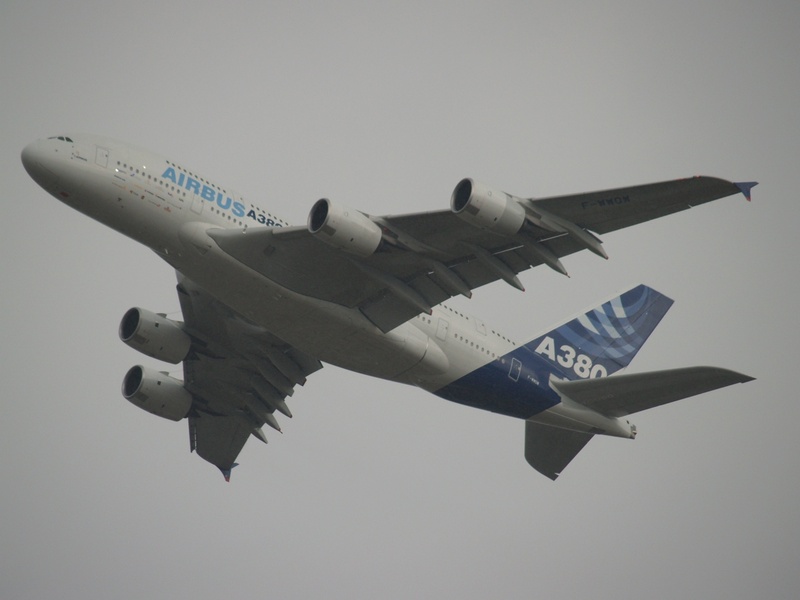 Of course the stars of the show were the planes, with the Airbus A380 being the star attraction. The world's largest passenger plane took part in the air display, requiring an incredibly long section of runway to get in the air. 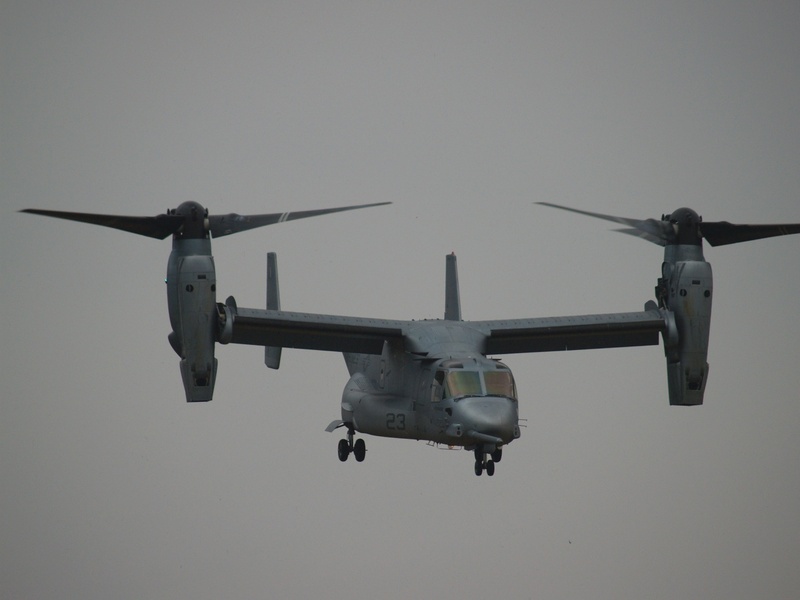 However the most impressive plane in the display in my opinion was Boeing's V-22 Osprey (third picture below). 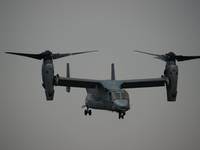 The Osprey is capable of rotating its propellers through 90 degrees allowing it to function as both a regular plane and a helicopter. It displayed impressive speed and agility so it should prove invaluable once it begins active service. More photos of these and the dozens of other aircraft on display are available here. 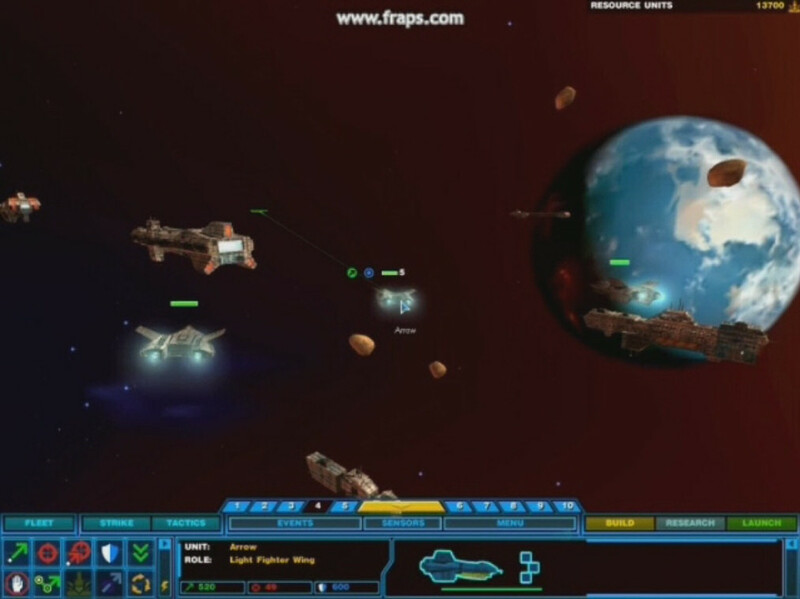 BrynS has compiled a neat gameplay video of a simulated mission in the WC4 Homeworld 2 mod. It details a thirteen minute skirmish between Confederation forces and and their unfortunate targets. 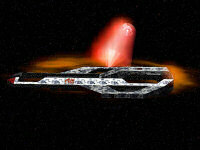 Massive numbers of both fighters and capital ships participate in this exciting fleet engagement. Border Worlds and Black Lance factions are planned for the full release, and a few of their ships appear in today's preview. High and Low quality versions of the full video are available in 110 and 42 megabyte flavors. A quick 30 second 5 meg teaser is also available. The action is very intense and should help people get a feel for the game beyond what all the basic screenshots have done. Certainly the X games have failed to be the new Elite, while fun, their complexity ignores the relative simplicity at the heart of Elite. 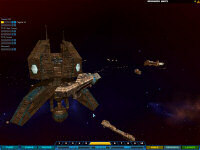 For me the closest game to capture the joy of Elite was Microsoft's Privateer... Compared to Privateer the atmosphere is lacking somewhat. Oh sure there's plenty of traffic around the trading stations and the like, but it feels rather artificial. 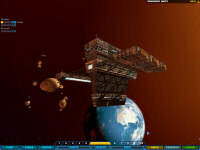 There's no sense the planets are involved in the space economy, no sense of traffic between the surface and orbit and no chance to go down to the planets as one did in Freelancer. That's right -- Microsoft's Privateer. Something is rotten in the state of Denmark! The Bloodfang, Prince Thrakhath's personal fighter, has appeared in quite a few Wing Commander games, including the WC2 Demo, WC2, WC3 and the CCG. 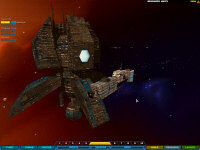 It's also the ship which appears in the famous 'Kill Wrathy' easter egg in Ultima VII. 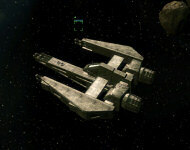 You can read all about the fighter in our ships section here. After Creative Labs stepped in, showing off their first 8-bit sound card revealing that games could not only have great-sounding music, but also voices behind the characters, there was no turning back. Games that were good before became even better with higher quality sound. 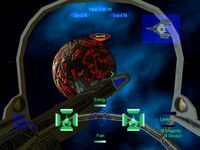 Items like the voice pack for Wing Commander II: The Heart of the Tiger sold like hotcakes, ushering in a new job for video game design: The voice actor. Wing Commander's involvement in this aspect of modern gaming was essential. The technology to play digital sounds existed long before 1991... but Vengeance of the Kilrathi was the game that made the SoundBlaster the industry standard, and then ushered in a new generation of multimedia games. 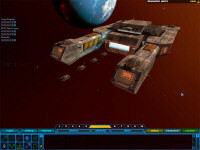 The Escapist has published a very nice article about the history of Wing Commander development. Wing Leader starts with a very interesting story about Wing Commander's original unveiling and goes through the series' evolution -- through to the fan efforts that continue today. It's full of interesting anecdotes, including a great story about Chris Roberts being punched in the face during the animation shoot for Wing Commander II. The article is ultimately a criticism of Roberts' decision to move on to Hollywood... but it presents some excellent information before reaching that end. The online magazine also published an article on Origin itself back in October - you can find that here. 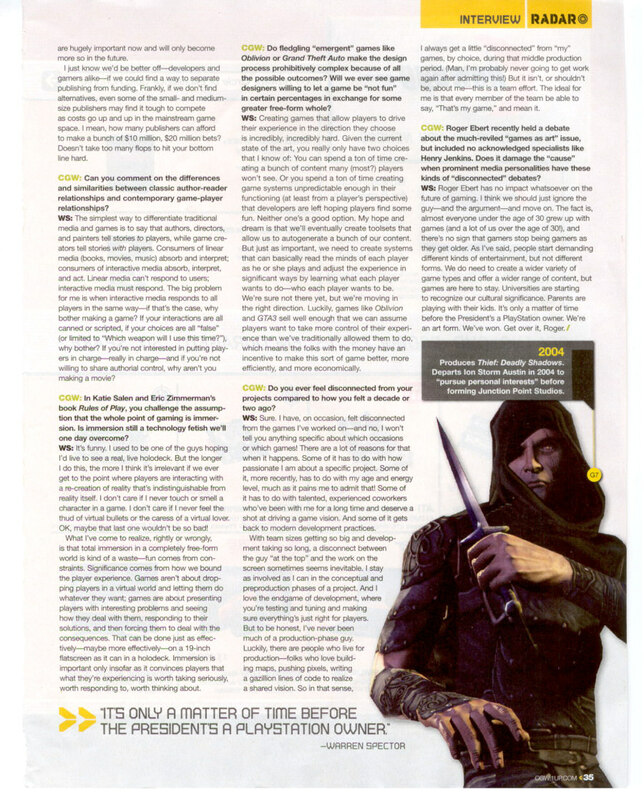 You can also find the article in an easier-to-read straight format of the current article here. I'll end this article on a personal note. I have always been a gamer, and have often ran the debate through my head about the value of upgrading my computer for gaming versus investing in a console instead. Back in the days of Wing Commander III, I considered buying a 3DO, but instead put the cash into a new motherboard and video card, which I think was the right decision. Gaijin sent us a neat screenshot. 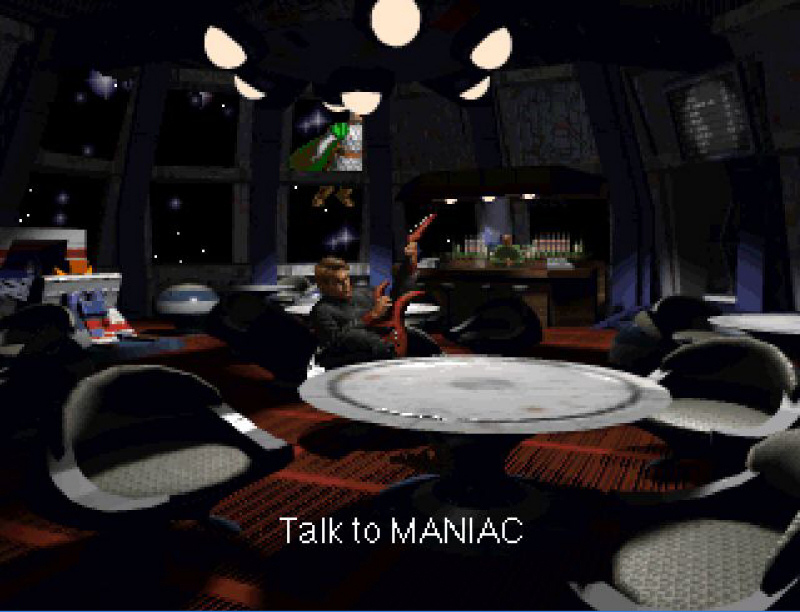 This Origin in-joke appeared in Super Wing Commander -- if you sat and watched the Tiger's Claw's lounge long enough, a surprising figure would pass by the window. Who is it? 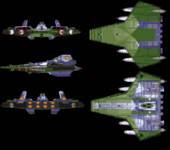 The Avatar from Origin's Ultima series of games -- he appears in Super Wing Commander just as he did at the start of Ultima VII Part 2, flying through space to Serpent Isle. I guess that makes up for the Bloodfang-class fighter which appeared in Ultima VII (details)! It may have taken six years, but Wing Commander fans running Linux seem to have a pretty robust platform to play their favorite windows-based games now. Mike Wagener reports that WINE version 0.9.13 and later can now play Wing Commander Prophecy without any special patches, tweaks or complex configuration. The results for him are smooth with no movie skipping or glitches during spaceflight. Mike's test system was an AMD64 X2 4400+ with Debian Unstable installed. The random crashes and other bugs we reported a couple years ago seem to have been fixed for the most part. 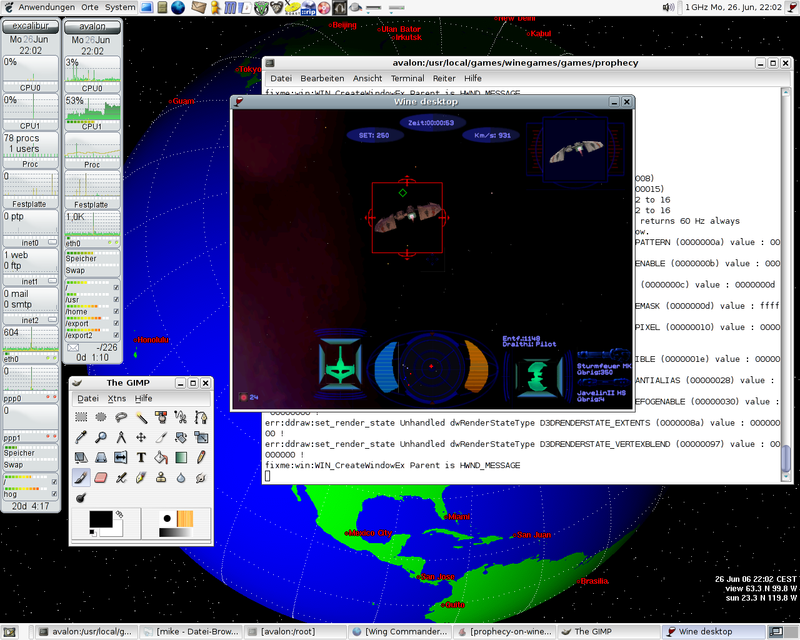 Older Wing Commander games can still be played on Mac and Lunix systems via DOSBox. 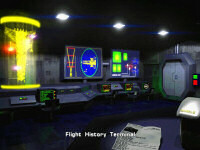 Hot on the heels of Howie's Cockpit Reference Pack, Wedge has posted his own collection of Wing Commander screenshots for fans to use. The set includes almost 250 images from Academy, Armada, Privateer and Wing Commander 1 through 4 with a strong emphasis on P1, WC1 & WC2. 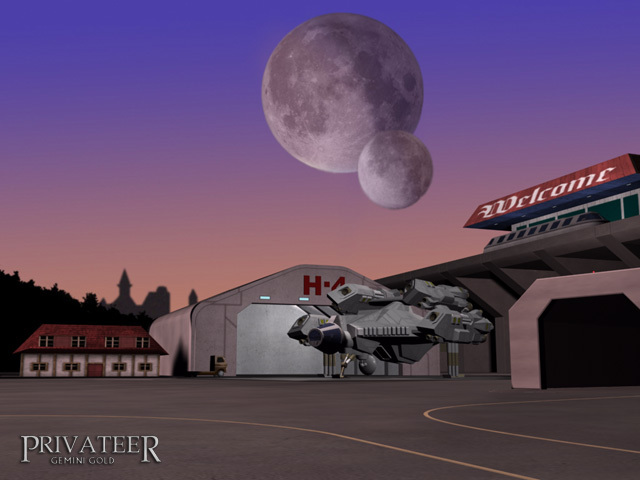 Many of the images were collected to build the scripts and walkthroughs available at Wedge's Wing Commander Site, and now individual fans can use these pictures to create their own projects or simply get inspiration. Even if you're not working on anything big and fancy, these screenshots are a wonderful reminder of all the diverse environments seen in the Wing Commander series. You can download the 5 meg zip here. 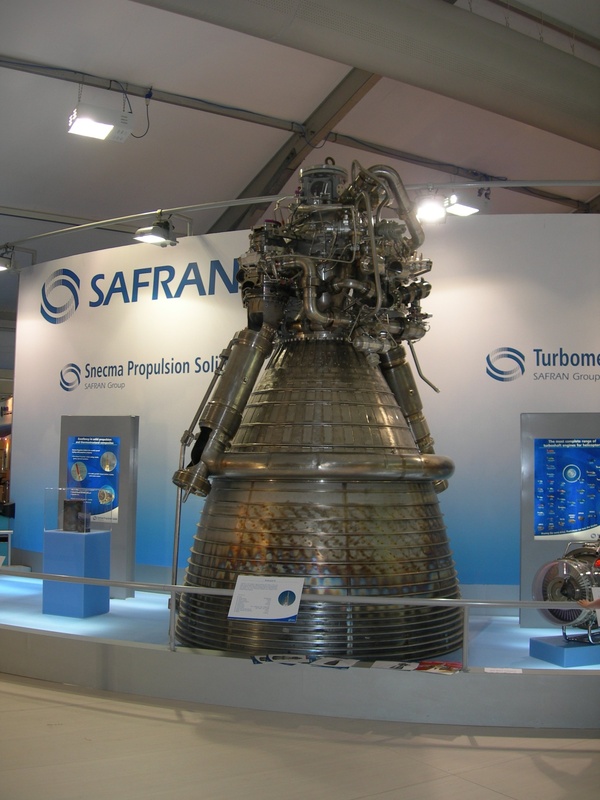 There's a lot of aviation and aerospace news coming out of the Farnborough International Airshow this week. One of the more exciting articles for our readers might be about the new spaceport located in New Mexico. The site was commissioned last year under the name Southwest Regional Spaceport and has now been renamed Spaceport America. It joins half a dozen other locations officially classified as commercial spaceports by the US Federal Aviation Administration. BrynS pointed out an article that highlights the debut of suborbital service being offered by Virgin Galactic. For $200,000, some 300 rich and famous guests have already begun booking seats aboard the first flights in 2008. The spacecraft that the company will be flying are an enhanced version of SpaceShipOne launched in 2004. 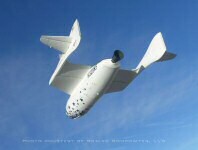 On a related topic, Origin founder Richard Garriot was the winning bidder on a statue which flew on SpaceShipOne's historic flight. His father was also famous Spacelab astronaut Owen Garriott, and the rumor a few years back was that he was toying with the idea of a $20 million trip to Mir. That never panned out, but it's a much more likely bet that Richard will be taking a trip to New Mexico before long. Since it's been more than a year and a half since our last update, many Wing Commander fans have assumed that Team Fat's Reorchestrated Wing Commander Album was cancelled. LeHah has managed to generate another status update on the project however, and although it's been on the back burner for quite a while, the project is not dead yet. Here's the word directly from the Fatman himself. The album is all sequenced out in its MIDI form. Dave has decided, however, _not_ to just take the old MIDI files and re-instrument them, but rather he wants to key the notes all in again, by ear. Ready for this one, though? The Amazing Dave Govett is now a cop. He graduated near the top of his Academy class, and was, I'm pretty sure, their best marksman and their best driver. Yes, he is such a cool policeman that the crooks he arrests actually call the police department to tell them how great he was. He's currently getting only nominal pay while he does on-duty training for the post he wants, so he's doing a sound library project for cash. He chose to do that rather than rush through the WC project. So, his studio is back on line and better than ever, and I've been told WC is Hot on his To-Do list. 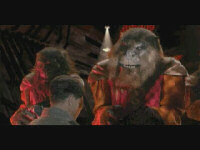 George "Fatman" Sanger and Dave Govett were responsible for the original soundtracks to Wing Commander 1&2. They've been working on a commercial reproduction of classic WC music, although the project has been stalled lately. One bonus track has been released and occasionally makes the live circuit. You can download the WC1 Surf Theme here. 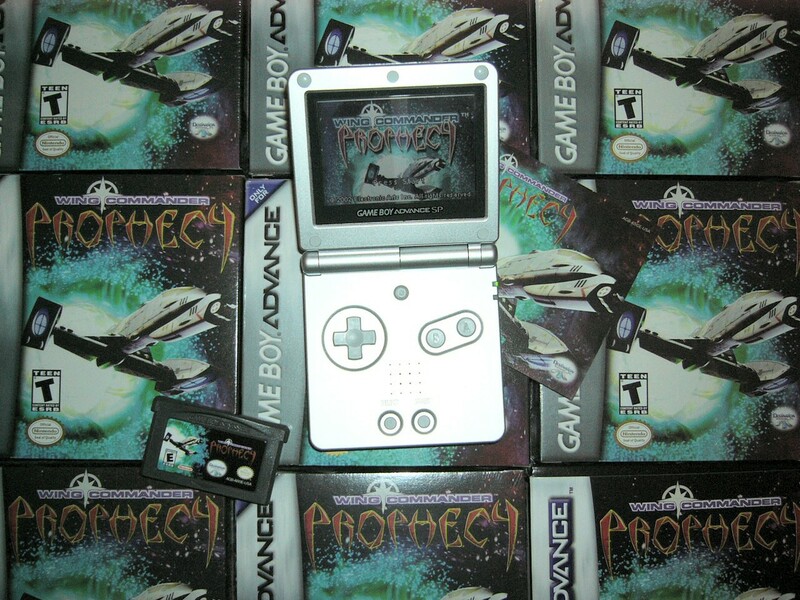 After the surprisingly success and quality of Prophecy Advance, we began covering new space combat sims for other handheld game systems and mobile devices. 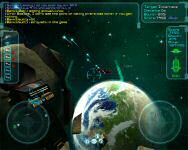 Darxide EMP is another portable space sim designed for Pocket PCs and Nokia Series 60 phones. The game is built around colorful combat, but players must also earn resources to upgrade their ships and prepare for more intense scenarios. David Braben, one of the original creators of the space trading game Elite, also contributed to some of the game's design. 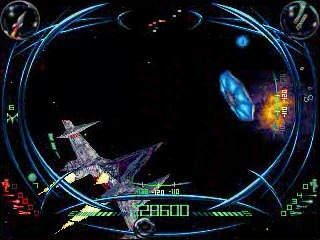 The handheld version of this game is a remake and enhancement of the original DarXide released for the Sega 32X. 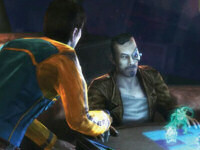 Bits of story are presented via brief cutscenes with recorded voice talent. 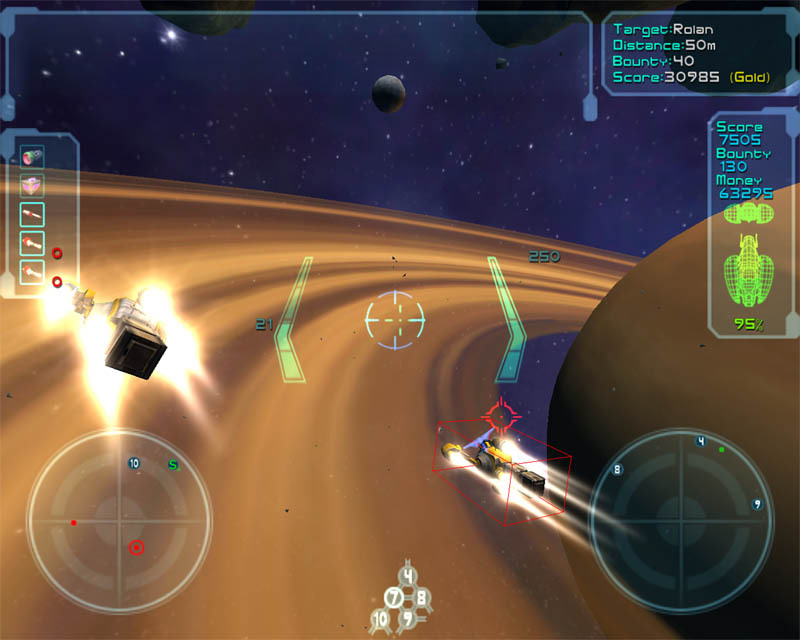 Controls were designed to be either left or right handed, and Pocket PC users can take advantage of touch screen functionality. 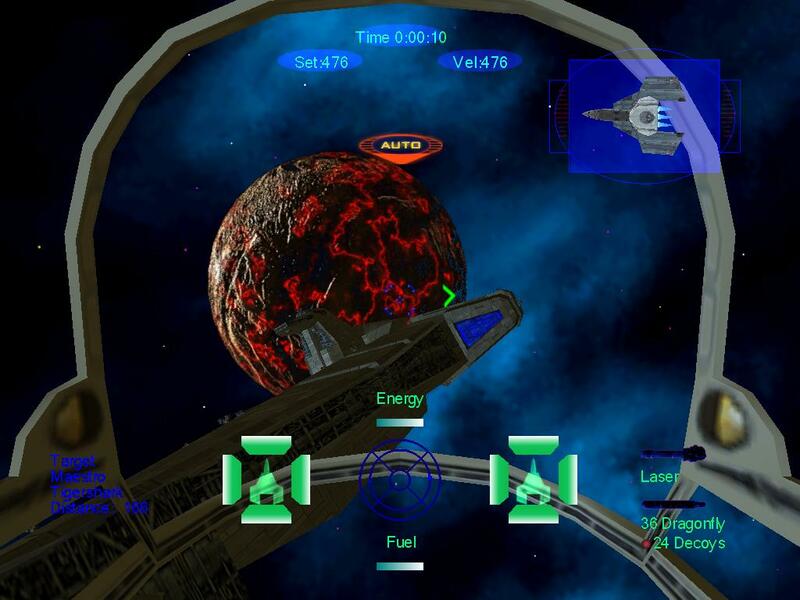 Darxide EMP retails for approximately $6.99 and has received many positive reviews. 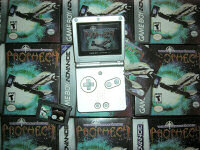 Microsoft awarded it with the "Best Game on Pocket PC" recognition shortly after its release in 2003. 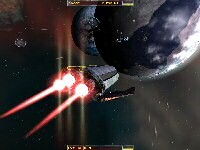 The game is currently on version 1.78 with various bugfixes and additional levels. We have put a lot of effort into game-play balancing to produce a well-pitched learning curve. 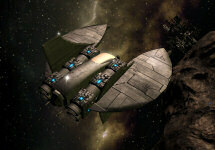 To progress you need to continually upgrade your ship with pick-ups. In addition to the 'quick fix' of destroying things, there is a variety of different, well structured, increasingly challenging mission criteria which mean that thought is required as you progress - enemies have different weaknesses and attack modes, and need different strategies to overcome them. 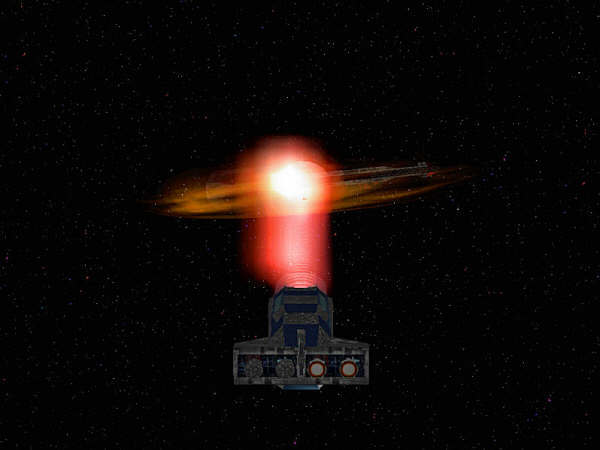 Later on in the game you also have to manage resources - for example as lasers get more powerful they deplete your energy quicker, requiring you to hunt energy crystals. Jump points. As seen below, a new 3D jump effect is now present. Completely scriptable custom cutscenes. 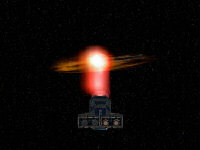 Act as the director, script in smooth camera and ship movements. 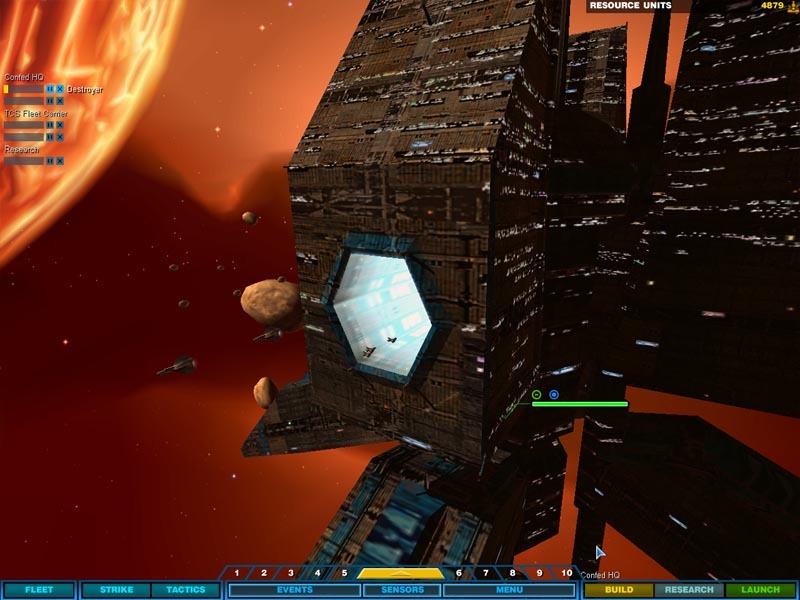 A sample cutscene is provided, showing a jump from one sector to another. Two all new sim missions. These gauntlet missions are scripted to provide bonus power-ups for kills. Six more ships are included. A kill board. Kills are tracked across multiple missions. 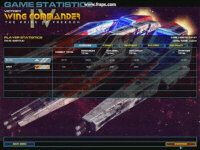 A login screen, so players can choose a callsign. Multiple rooms. Modders can now have an unlimited number of rooms. A sample ready room and rec room are provided. More screen resolutions are supported. Lots of new scripting commands for the modder. 33 new script functions are provided. A new orchestration of the Kilrathi theme: featuring a real electric guitar and organ. 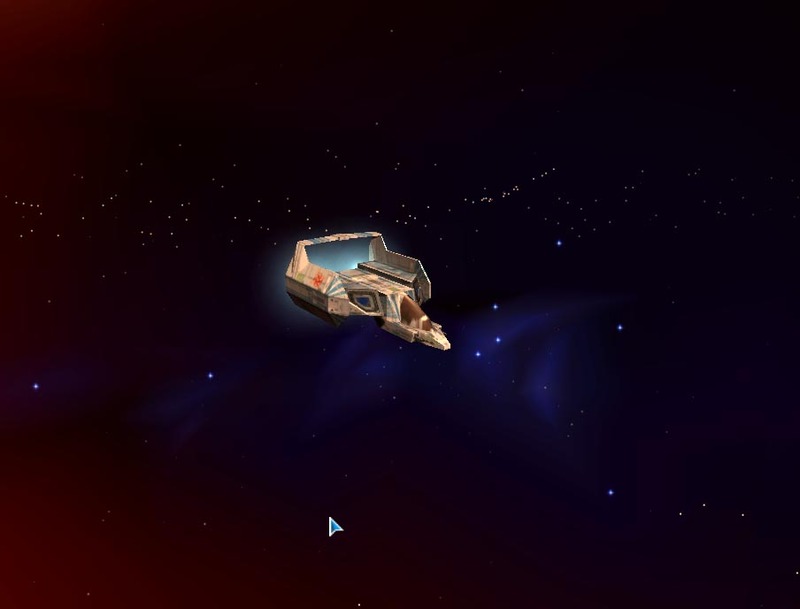 Having a ship jump in is simple with the improved mission editor. Navigation points can have a name assigned to them, which should make it easier to tell them apart. 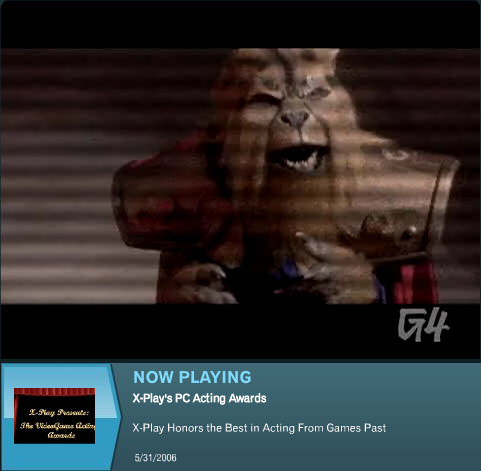 BrynS has managed to capture the the PC Acting Awards clip featured on G4's X-Play last month. 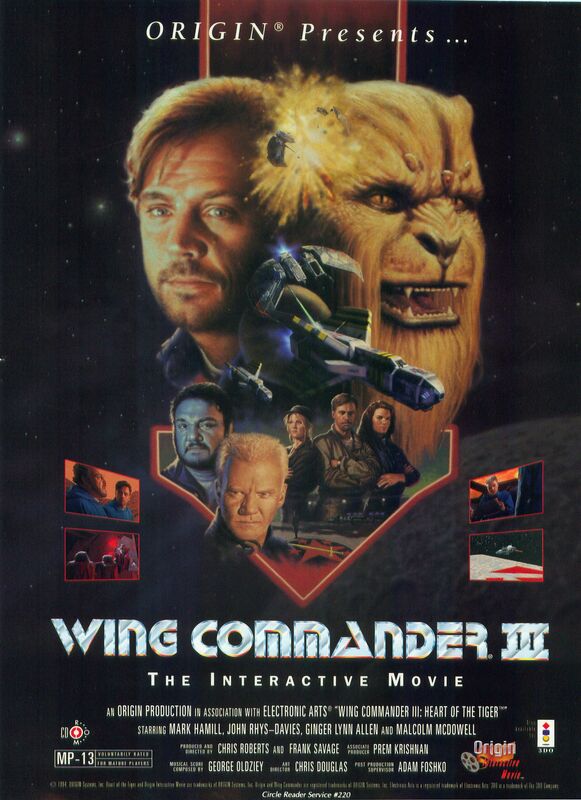 Wing Commander 3 is featured along with several other classic titles to feature live-actor FMV. The whole feature is pretty corny, but if you had problems with the flash player before, now you can try an Xvid encoded version now here (34 megs). 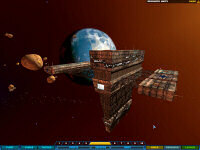 Aaron Thomas has mostly completed his elaborate model of Confederation Headquarters for his WC4 Homeworld 2 mod. 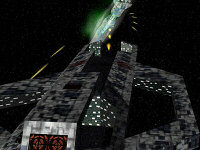 This large iconic structure is seen in Wing Commander 3, 4 and Prophecy. 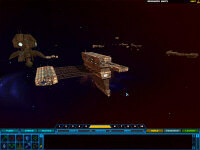 In addition to the large starbase, various elements of the Confed fleet are visible posing in each shot. The textures on each hangar bay were also made to resemble WC flight decks a bit more closely, although that occurred after the pictures below were taken. Aaron is now getting some additional help by a few dedicated Crius.net posters who've helped locate different reference material and provide feedback. Now only the shipyard structure remains to be built before a limited beta test of the Confederation skirmish mode can be conducted. Aaron, who lives in India, also narrowly avoided the massive train bombings last week by a scant ten minutes or so. We're glad he made it through okay and hope everyone stays safe. 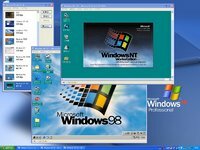 Can't let go of Windows 98 for compatibility reasons? Microsoft's Virtual PC can now be downloaded free. So what does it do? Microsoft Virtual PC 2004 allows users to conveniently run multiple operating systems on a single computer. Users can switch operating systems as easily as they switch applications—instantly, with a mouse click. As a migration tool, Virtual PC provides a cost-effective safety net for certain employees to run critical legacy applications on an interim basis while you continue migrating to a new operating system. Virtual PC also helps companies more rapidly develop, test, support, and deploy applications. To add a virtual machine with the operating system of your choice, you need the original Windows or DOS installation disks. If you own any Windows games that won't run in XP or Vista, this is more convenient than dual booting. DOSBox, Compatibility Mode and a few fan-made patches are enough to get the Wing Commander games running on a modern computer, however, and may be easier for novice users to figure out. A lot of aspiring modders or Wing Commander fans who are thinking about getting into fan projects ask about reference material to start with. Not a lot of people have a back stock of screenshots and resources like this available however. Howard Day has made it slightly easier for these fans now with a thorough Cockpit Reference Pack. 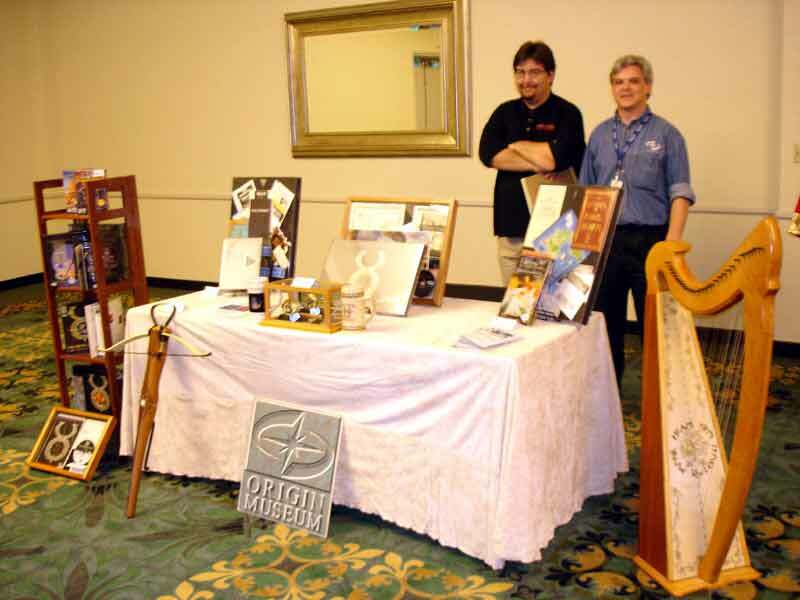 He's collected art from virtually every flyable craft from WC1, WC2, WC3, Academy, Armada and Privateer. If available, most ships have side, rear and exterior shots as well. Since he extracted the art files directly in most cases, many images are in 320x200 resolution. Zooming in works fine though, and the small files have reduced the pack's size to a tiny 2.5 megabytes for almost 150 pictures. And this isn't just fun for people interested in designing games. If you don't recognize all the Wing Commander images below, you should grab the pack here to study up! bakedpotato called to let us know that the Lancers Reactor community hub for the Freelancer and Starlancer games is currently suffering technical difficulties. Their main server had a hard drive fail, and it will probably be a couple more days before the site is up and running again. TLR and the CIC have a similar reader base because of Chris and Erin Roberts' involvement with Digital Anvil. They continue to maintain a very active modding community for Freelancer, and the site occasionally carries news for games such as Dungeon Siege 2 and Darkstar One. 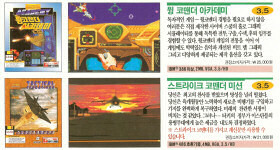 Here are some Korean missiles that won't malfunction! 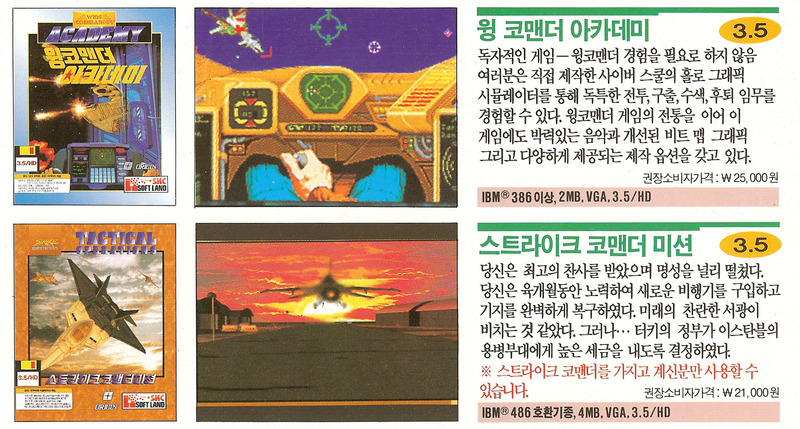 Following in the grand footsteps of Alkarion's recent updates comes The Origin Museum's Joe Garrity, with a pair of high quality scans of foreign Wing Commander advertisements! 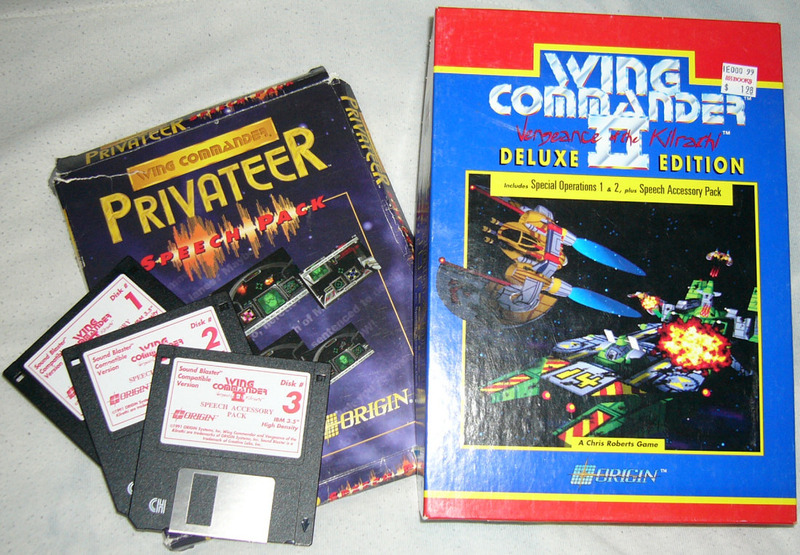 The pages are for Privateer, Wing Commander Academy and Tactical Operations. It seems a normal thing today, but the idea of developing Wing Commander 'spinoffs' was entirely new when Academy and Privateer were announced in 1992. It was an exciting time. 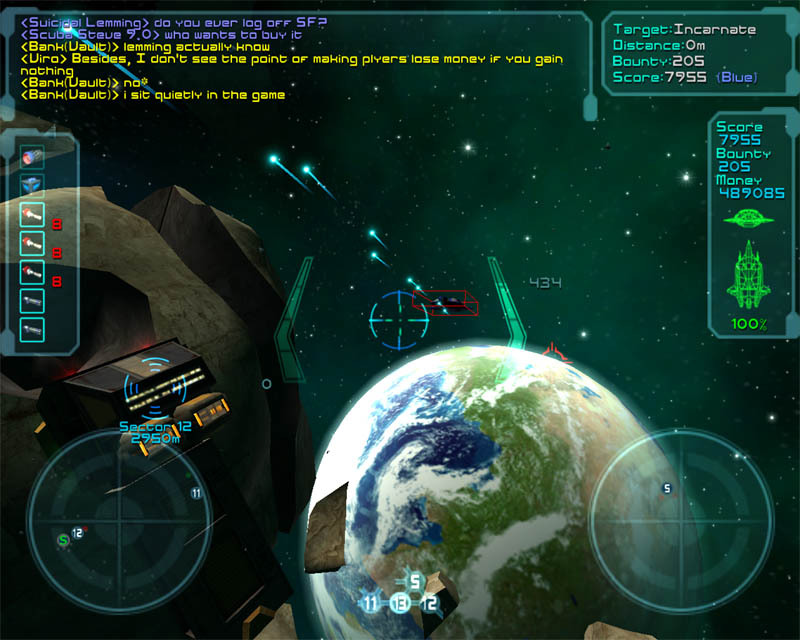 Tactical Operations was the add-on disk released for Strike Commander. It continued the story and introduced several new airplanes... including F-117 Stealth Fighters, which were white with green spots! 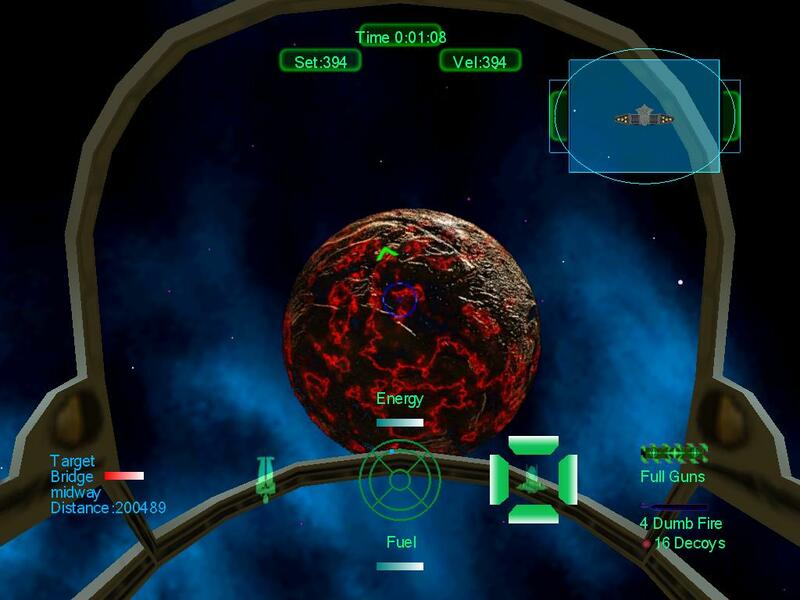 "Ground controllers, in a joking e-mail to the crew, suggested several games to pass the time, including "who can toss the laptop furthest down the station before it bounces off the wall" and "a few appropriate computer games" such as "Asteroids, Space Invaders or Star Wars' Wing Commander." Star Wars? Why, I never! But it's still pretty neat... watch out for stealth fighters, Discovery. Bret wanted to let everyone know that the full text of mission control's email can be found here. 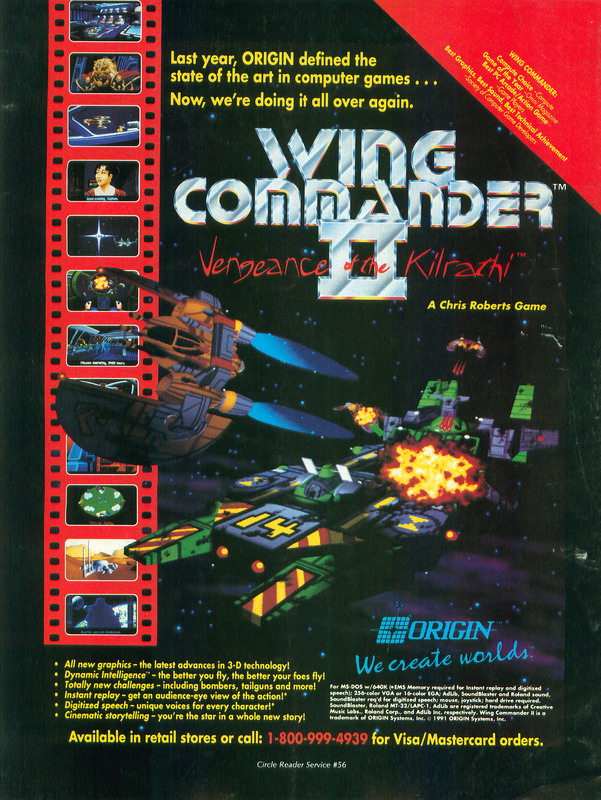 Rounding out his recent trilogy of classic Wing Commander advertisements (here, here and here), Alkarion has provided us with three scans relating to other amazing Origin games. 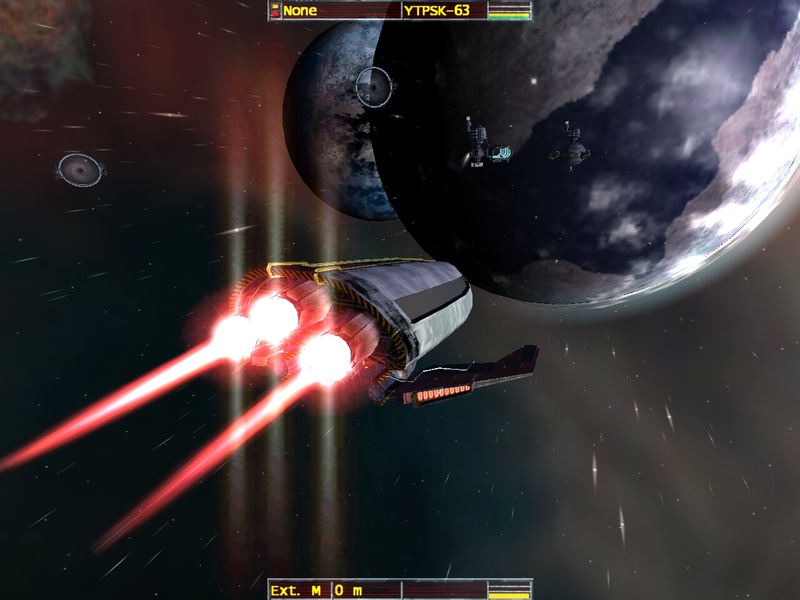 In this case, it's Origin's three RealSpace engine flight games. 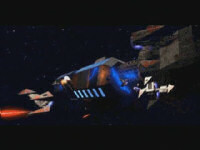 The RealSpace 3D engine was also used on three Wing Commander games: Armada, Heart of the Tiger and The Price of Freedom. 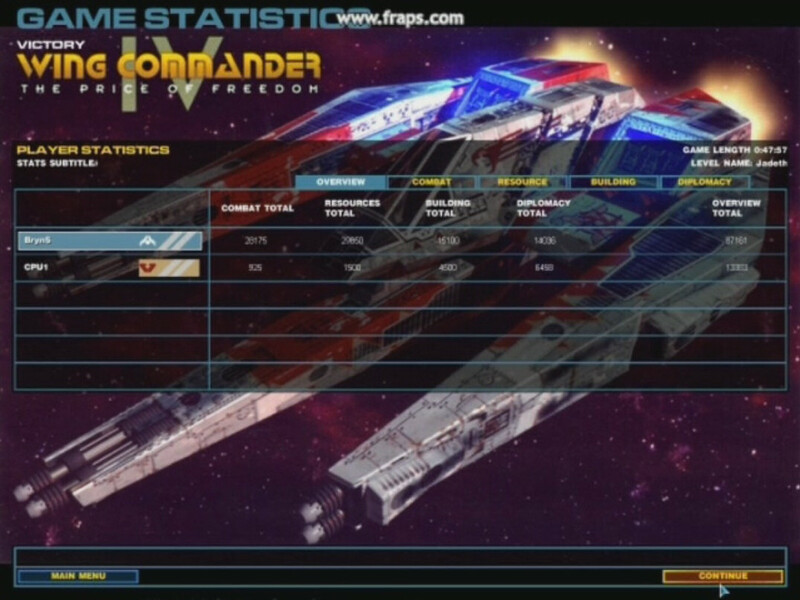 First is Strike Commander, Chris Roberts' 'other' big interactive movie. 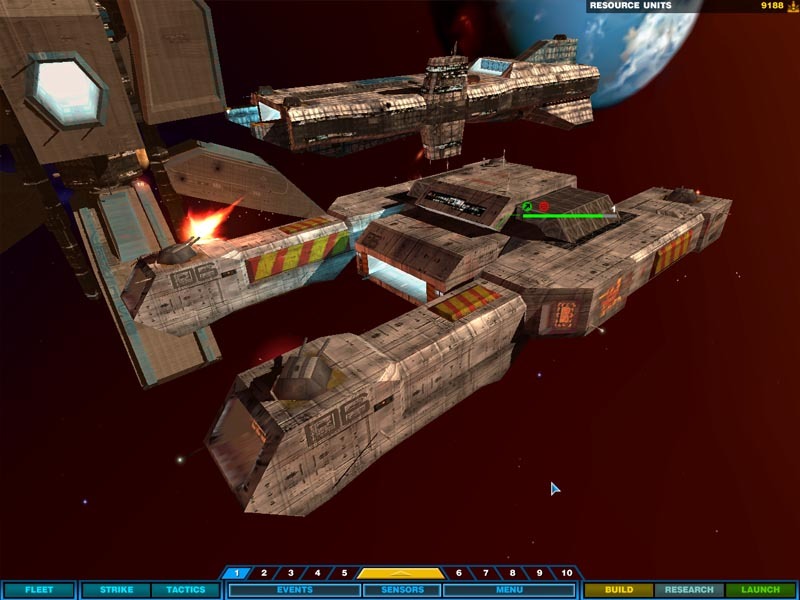 Strike Commander a cross between Falcon and Privateer, with a Wing Commander style movie storyline thrown in for good measure. 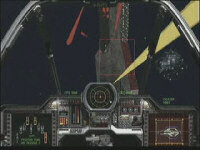 The player commanded a squadron of mercenary pilots flying F-16s... and was not only responible for shooting down a host of modern aircraft, but also for buying new weapons and picking from various paying missions. Strike Commander was also famous for its constant delays - it was released well over a year after its original announced date. 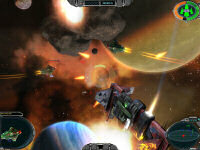 Unfortunately, that delay meant that a followup game, Phoenix Force, was cancelled after being plotted. 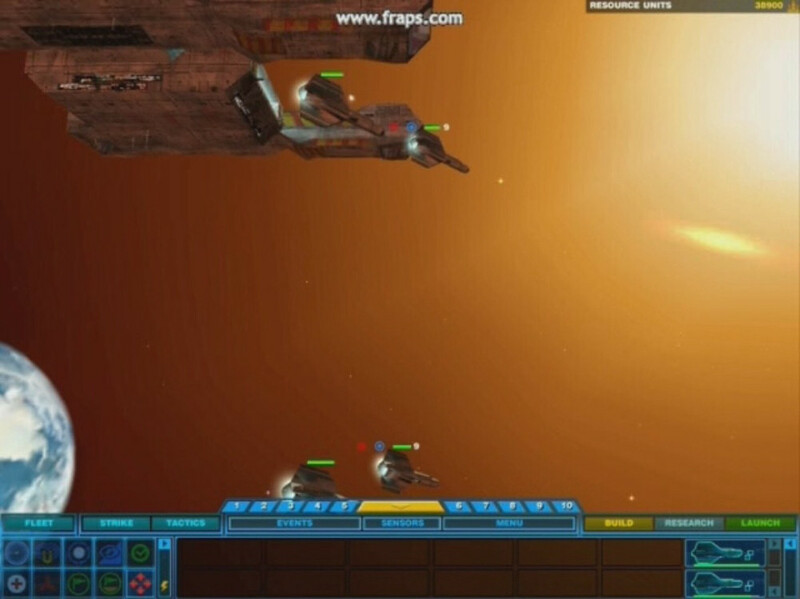 Next is Pacific Strike, an earlier RealSpace game that met with a sadder fate. 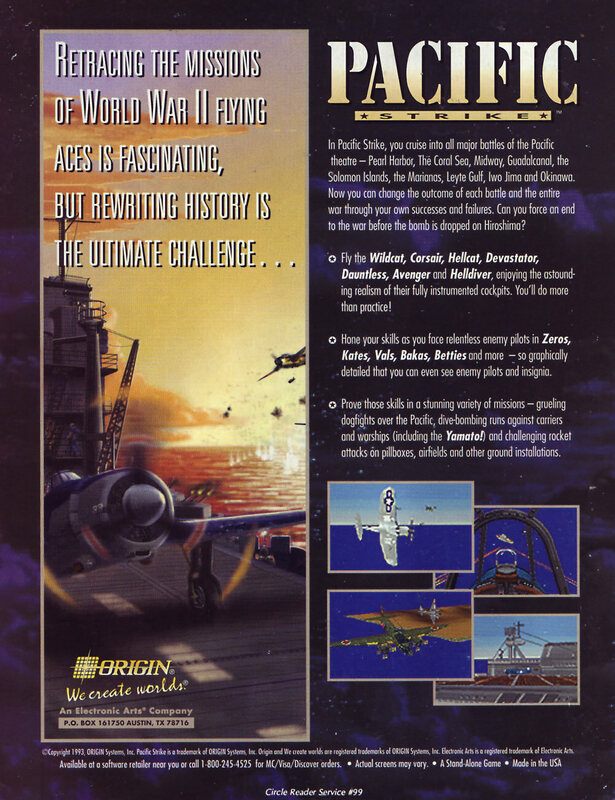 Pacific Strike was Origin's last disk-only game, and the version that shipped was unfortunately buggy. 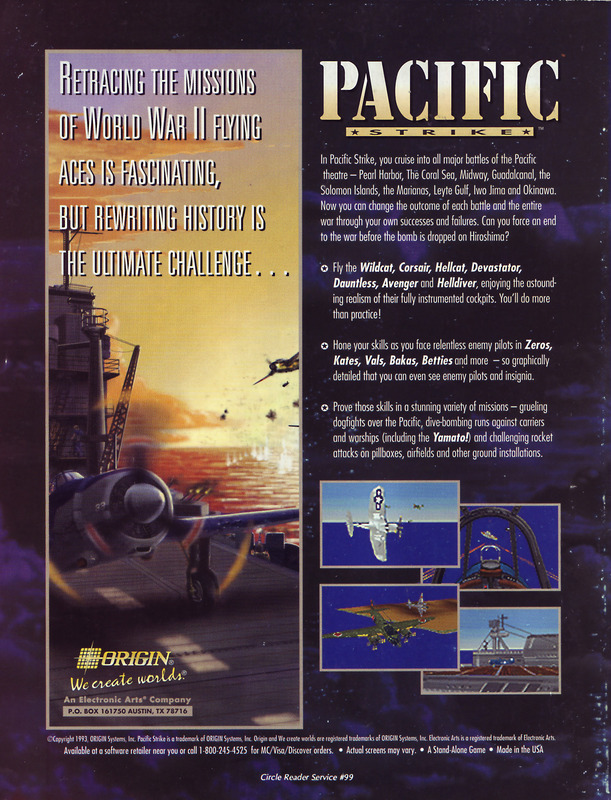 Low sales meant that two Pacific Strike followups, a '1946' mission disk and a full speech CD-ROM release, were cancelled during development. In the case of the full speech version, that was after all the dialogue had been recorded! Pacific Strike is actually a pretty cool game - one of its most exciting features is an entirely dynamic campaign... your performance not only defines how the war will end, but what kind of enemies you'll face in each mission (ie, kill enough carriers at Midway and fewer Japanese pilots will appear later on). The elaborate scripting was amazing! 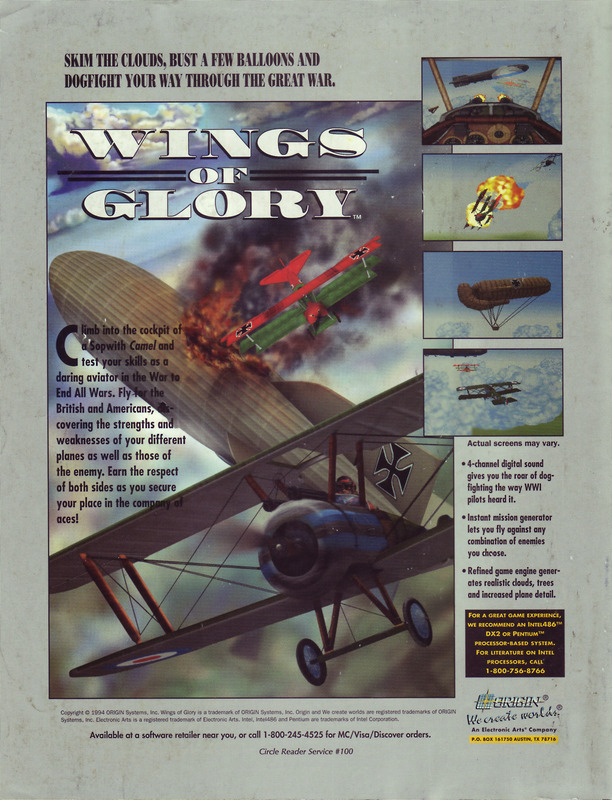 Wings of Glory was the penultimate use of the RealSpace 3D engine, and certainly the most striking. The slower and more colorful world of World War I combat put Strike Commander and Pacific Strike to shame. 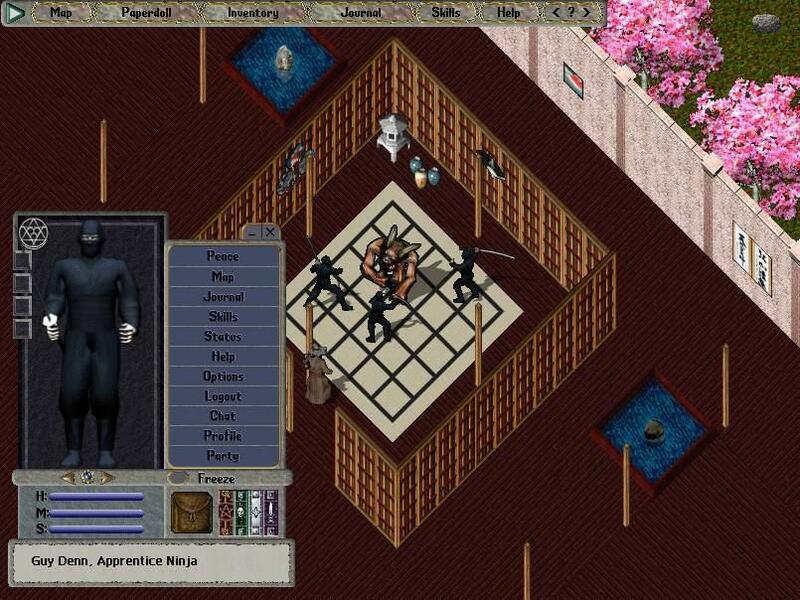 The game also featured Privateer-style 'talking heads' and a classic Origin cinematic storyline (read: there is a traitor). If you haven't played WoG, give it a shot - it's on my personal top ten games list. 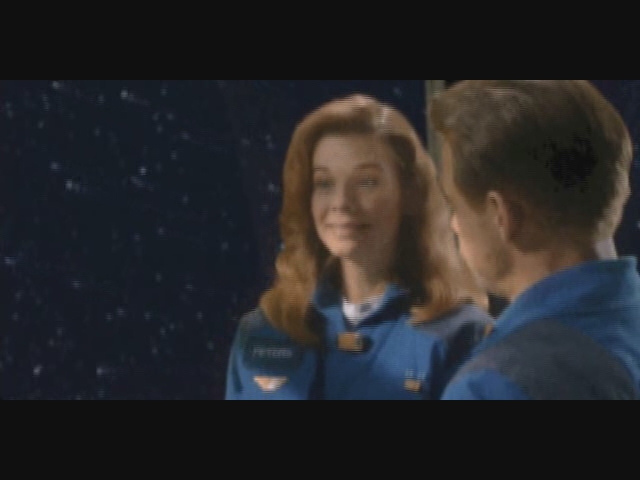 Cam has asked that we post an announcement from the Wing Commander: Against All Odds. 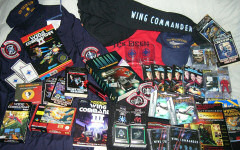 We're always interested in promoting Wing Commander fan groups online, and this is no exception. 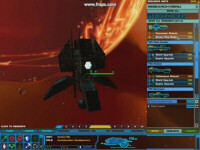 If you're interested in internet role-playing in a Wing Commander universe, give them a shot! It is a time of great trials in Gemini and Enigma Sectors. The Kilrathi have committed their to multiple offensives, that are threatening Perry and have already crippled the Speradon Shipyards. 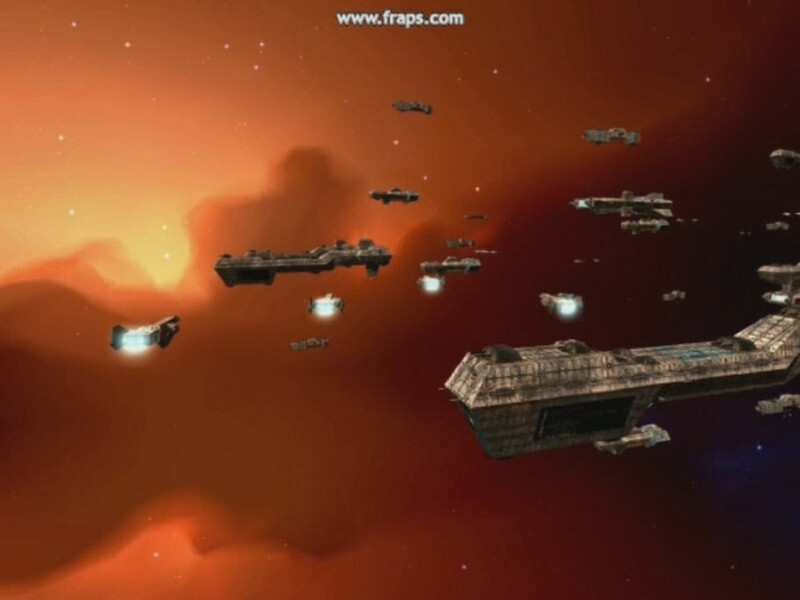 However, the 8th (Gemini Sector) and 14th (Enigma Sector) Fleet commanders are vigilant in commanding their forces as ever. 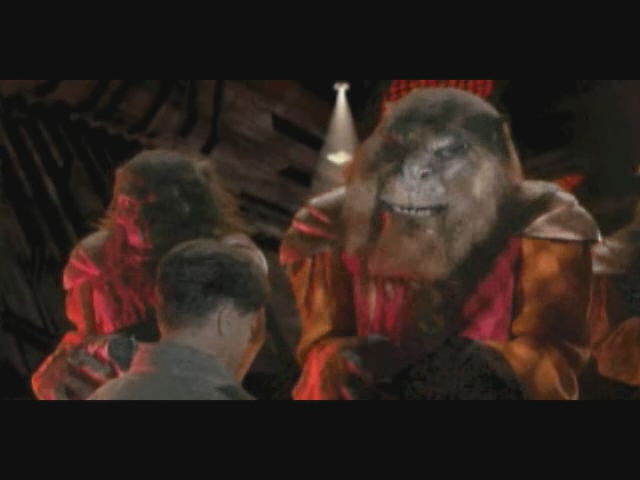 They are currently drawing up plans to put an end to these Kilrathi offensives. 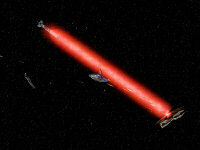 Though there is one problem, the plans require more task force commanders. We need YOUR tactical expertise in defending the Terran Confederation from the Kilrathi Empire. Wing Commander: Against All Odds is a forum based role-playing game. 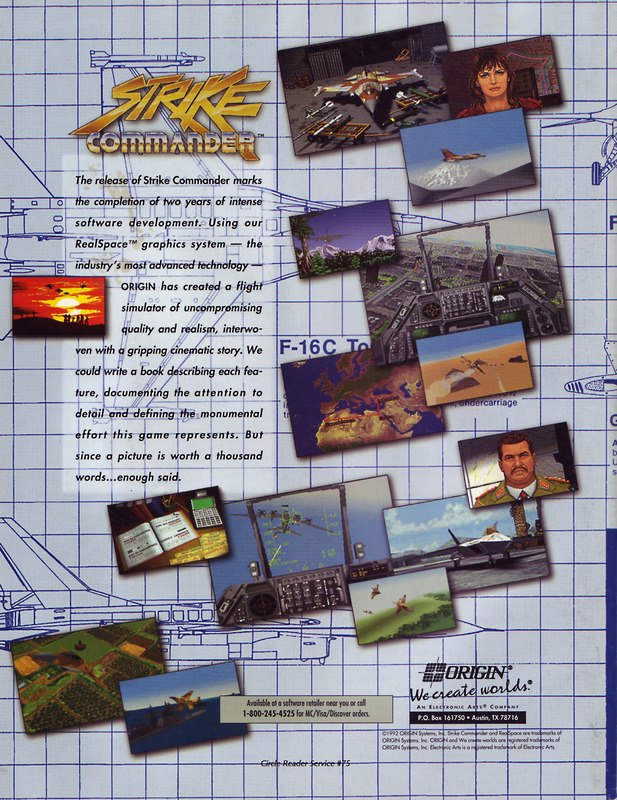 However, it is unlike most Wing Commander rpgs. 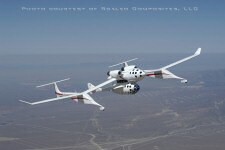 WCAAO concentrates on fleet based battles instead of fighter battles. 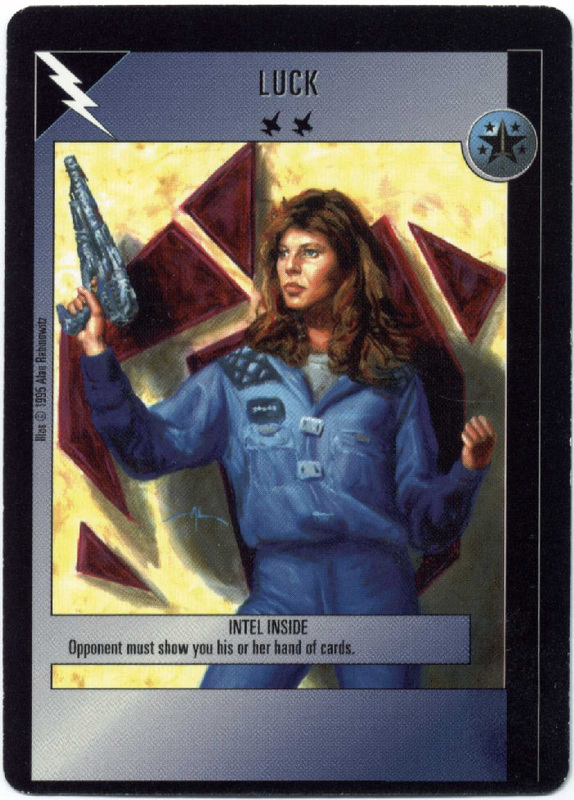 You will start at the rank of Commodore, assigned to the command of a task force in Enigma, Gemini, or Vega Sectors.Once you have been given your Task Force assignment, and started a task force thread, you will begin to battle with the Kilrathi players. John Cordell wanted to let everyone know that although the next version of Gemini Gold is still a little ways off, the team is working hard to polish up certain parts of their fan remake of Privateer. It might seem like these guys have been around for a while, but the GG project was actually just announced one year ago this week. In that time they've sharped up their code and made many graphical improvements. 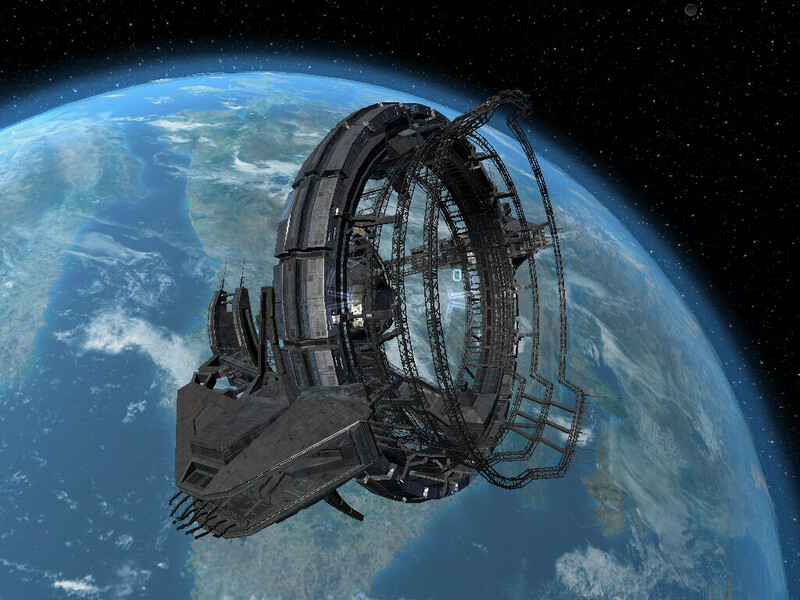 Recreations of the game's art continue, and the team has just successfully rerendered the landing area at Oxford and smoothly integrated their own ship models. The Moon(s) do look somewhat out of place though. Oxford is where I mainly hung out back in my Privateer days, so I'll be anxious to see what else they do with other locations on the planet. 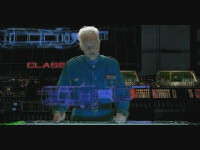 Multimedia Mike has made some breakthroughs in the study of movie files used in the 3DO port of Wing Commander 3. 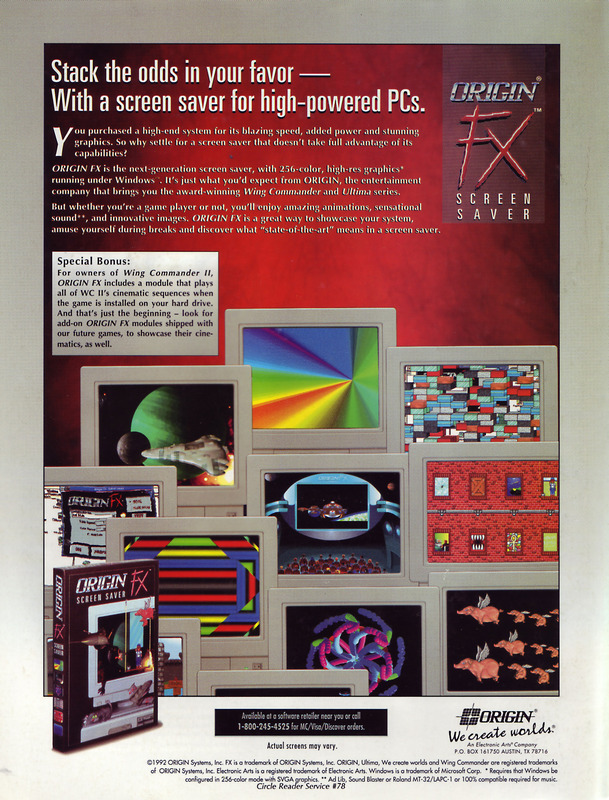 He has written an article on custom movie file formats used for the 3DO in his multimedia exploration journal here. It looks like the core files used in both the DOS and 3DO versions are similar, but the console port uses BUN files instead of more familiar TRE files. 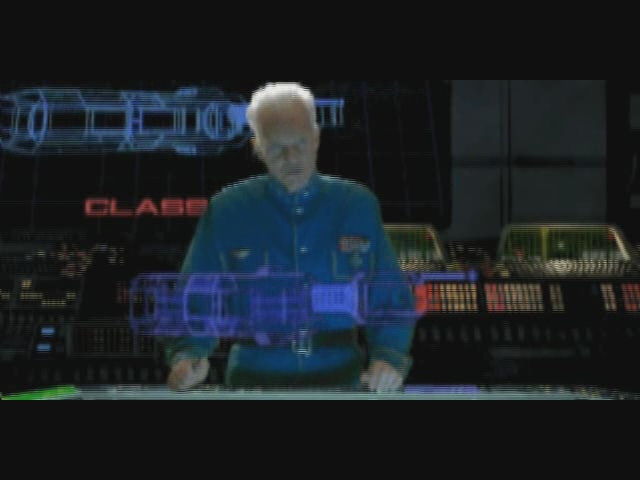 It all looks pretty technical to me, but someday this might help video artists cleanly extract the higher quality WC3 cutscenes included in the 3DO version of the game. 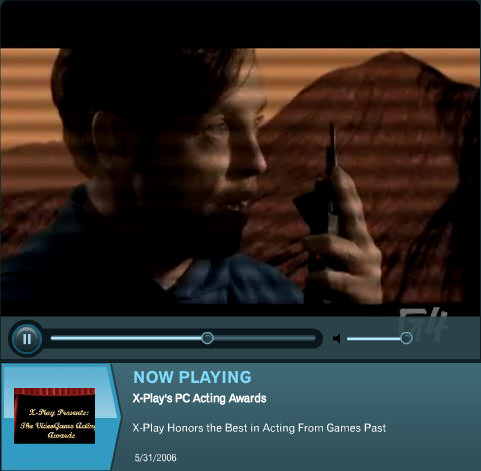 Mike also recently conducted some research into Origin's Xan format which was used on most of the games with live-actor FMV. Thanks to AD for pointing this one out. We're now just one month away from the next CIC Birthday Party! It's been almost eight years since our grand opening, and we're throwing an online get-together to celebrate. You're all invited to come and join us on August 10 in our #Wingnut irc chat room. The gathering begins at 7:00 pm Eastern US (4:00 pm Pacific and 11:00 pm GMT). Beginning at that point, we count down for one hour before updating the website with a ton of special updates. Check out last year's updates here to get an idea of what to expect. The party is always a great opportunity to meet fellow players, get involved with fan projects and win amazing door prizes. Although the main event is only lasts for a few hours, dozens of fans will stay all night catching up on old times and setting up multiplayer Wing Commander games. First time users are welcome to stop by #Wingnut through our web browser interface any time. See you at the party! 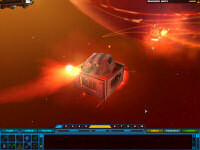 Hurleybird tipped us off about another article on the fate of Origin. We get a lot of questions about this, so more clarification on the matter is a good thing. The Next-Gen article does a good job of outlining the structure of events and setting up a timeline. Origin began working with Electronic Arts as early as 1984 and was completely purchased by the company in 1992. The author injects a bit of commentary at that point about the negative impact of this. What the article doesn't spend much time on is how EA probably saved Origin from bankruptcy in the early 1990s and funded massive projects such as Wing Commander 3 & 4. 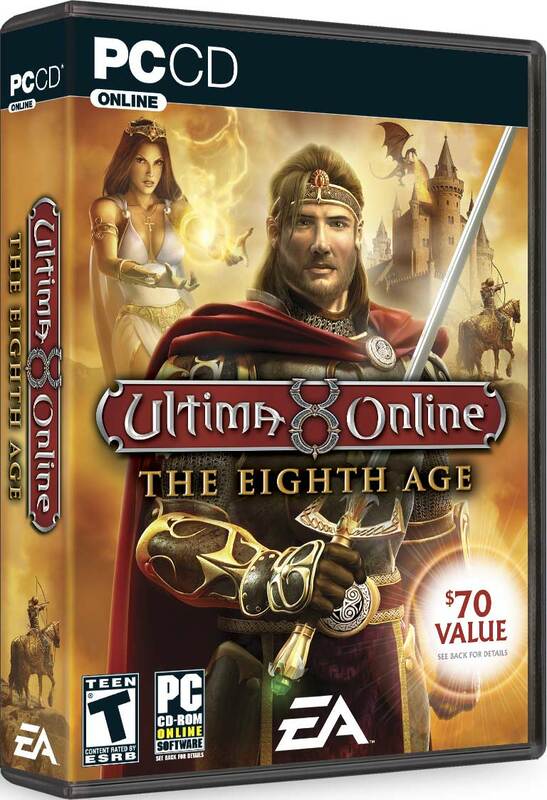 Furthermore, Origin wasn't just dropped after Ultima Online's surprise success. For half a dozen years, EA went back and forth with them on a number of Wing Commander and Ultima projects that ultimately didn't work out. The complete story behind Origin's fate is very complex, and fans are welcome to ask questions by hitting the Discuss link below. Although the symbolic effect of closing Origin's Austin studios hit many people hard, EA continues to reevaluate Origin's classic franchises and pursue opportunities when the timing is right. The rerelease of Ultima and Privateer on the GameTap service is just a tiny glimpse at what the future holds. You can cut straight to the Origin page here. Austin's Looking Glass Studios is also covered a few pages after that. 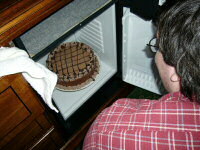 Speaking of birthdays today, CIC staff member Cpl Hades celebrated his own yesterday. Although you don't always see his name up here as often as mine or LOAF's, he's always ready to cover the news when we're away or work through any difficult technical issues when Kris is gone. Hades is our most multi-talented staff member and is a vital part of making sure you all get your Wing Commander fix each day (when he's not cooking up new cereal recipes). Happy Birthday! 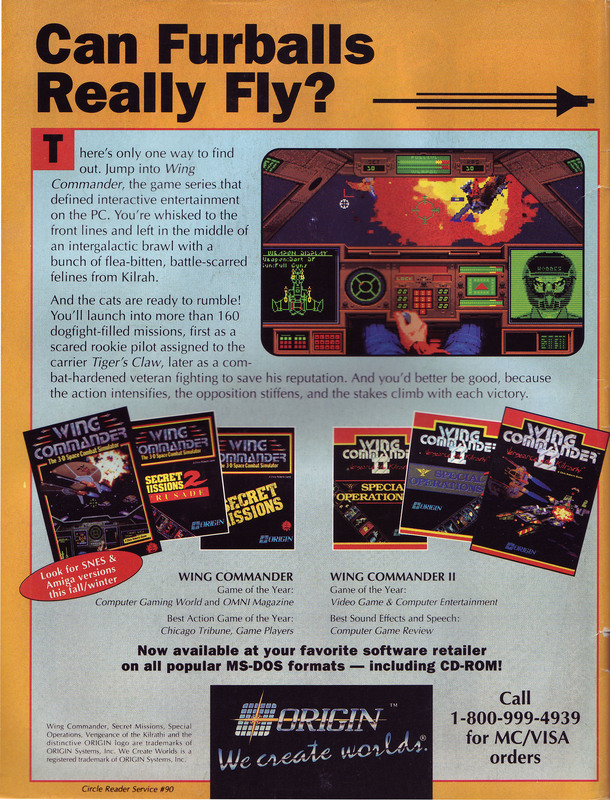 Here's three more full page Wing Commander-related advertisements, courtesy of Alkarion. You can see the last sets here and here. The first shot shows the classic Wing Commander III artwork, making the bold claim that it is "THE INTERACTIVE MOVIE." 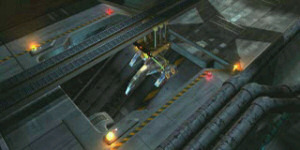 The four inset screenshots are taken from the first set Origin released to the public, well before the game's release. Note the "also available for the 3DO" logo -- Origin was taking that port seriously very early on. 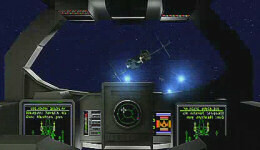 The final advertisement was part of 1995s 'interactive movie' push, which included System Shock, Ultima VIII, Wings of Glory, Wing Commander III and Wing Commander Armada. "Hunt down the meanest aliens in dozens of different galaxies -- without having to guess what they really look like." There are a few things that we've come to expect from "space games," regardless of whether they rest on the Wing Commander or Master of Orion side of the spectrum... From our time playtesting a preview build, the game sits squarely on the Wing Commander side of the spectrum... 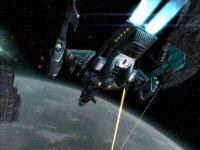 The actual gameplay, as mentioned, is pretty action-oriented -- think Wing Commander." 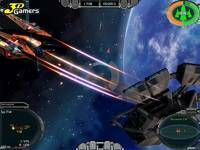 Since a lot of us are fans of titles such as "Elite", "Wing Commander" and "Freelancer" the decision to make a space shooter came naturally. 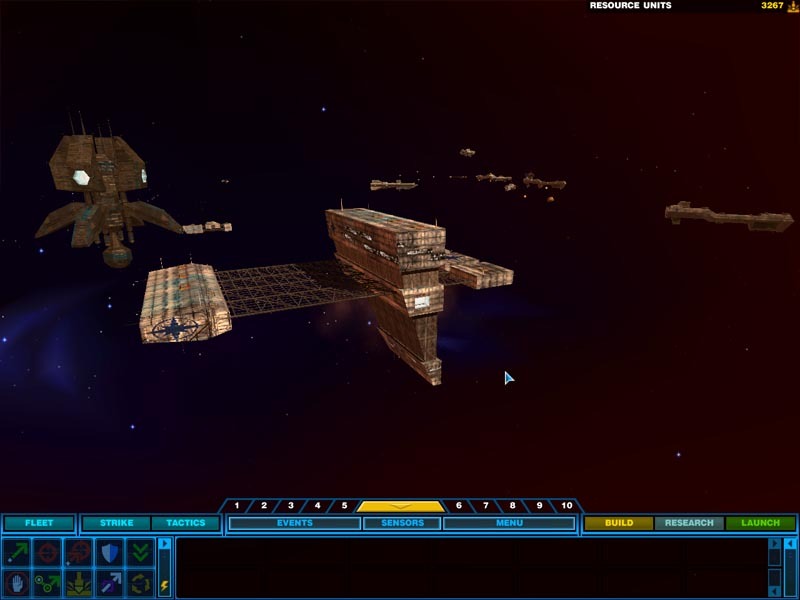 We decided to create a "simulated" civilization in space that we then connected with a compelling story and a lot of action. Sharp-eyed fans have noticed that the lineup at GameTap has grown recently. Origin's Ultima I through V are now all available for subscribers. 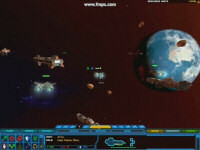 GameTap provides a huge assortment of classic games for members to play on their modern computers for about $10 per month. The other EA games now available are Populous, SimSafari, Sim City 2000, SimTower and SimTunes. 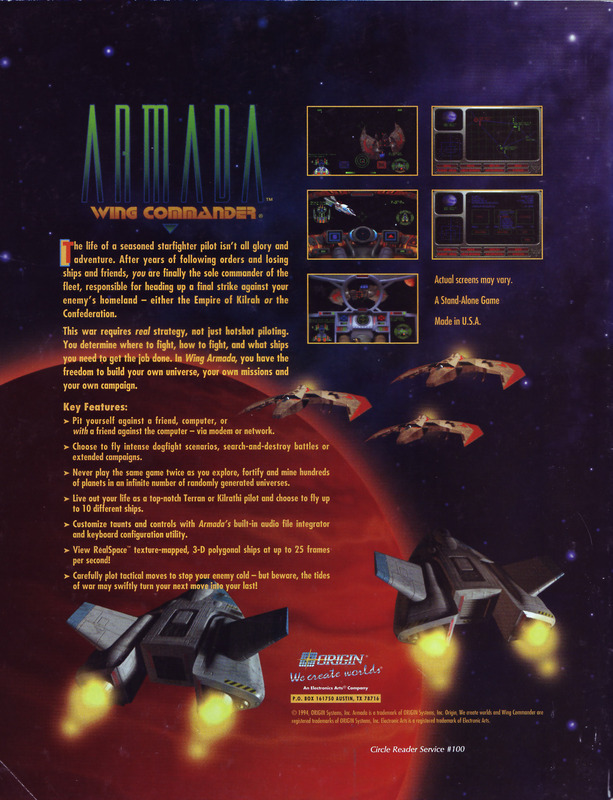 Earlier this spring, an advertisement with C&C First Decade revealed that Wing Commander Privateer, Command & Conquer Red Alert and number of Ultima games would appear on the service soon. A visit to the default GameTap homepage now reveals screenshots for all these titles, so it's only a matter of time before Privateer arrives. 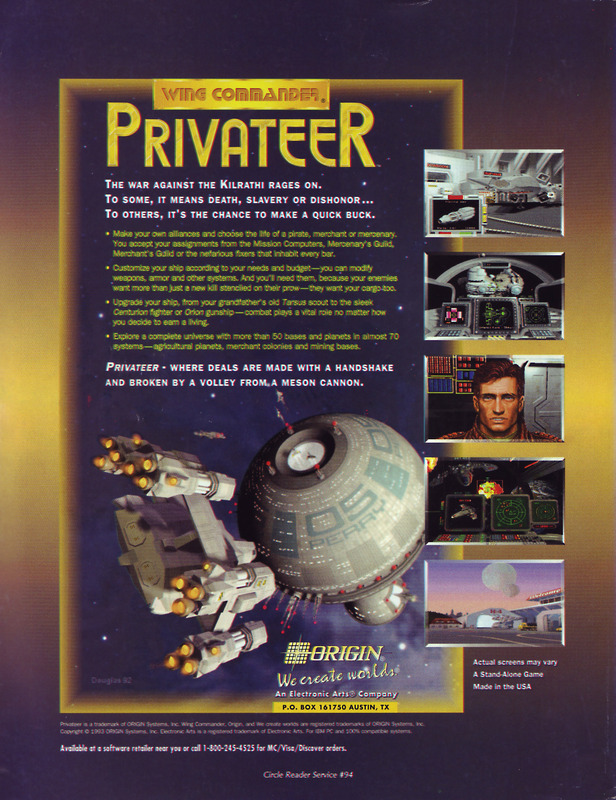 DOSBox is great for Wing Commander fans to play the titles they already own, but this new release of Privateer will help introduce the series to a whole new group of people. And fans who've had difficulty tracking down a copy now have no excuse to miss out! Hop through space and time and stop the evil enchantress, Minax, before she erases your very existence! © 1983 Electronic Arts Inc. Ultima and Origin are trademarks or registered trademarks of Electronic Arts Inc. in the U.S.and/or other countries. All Rights Reserved. Lord British is a trademark of Richard Garriott. 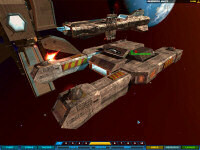 Blogcritics.org has written a belated review of Vendetta Online in which they compare it to Wing Commander Privateer. 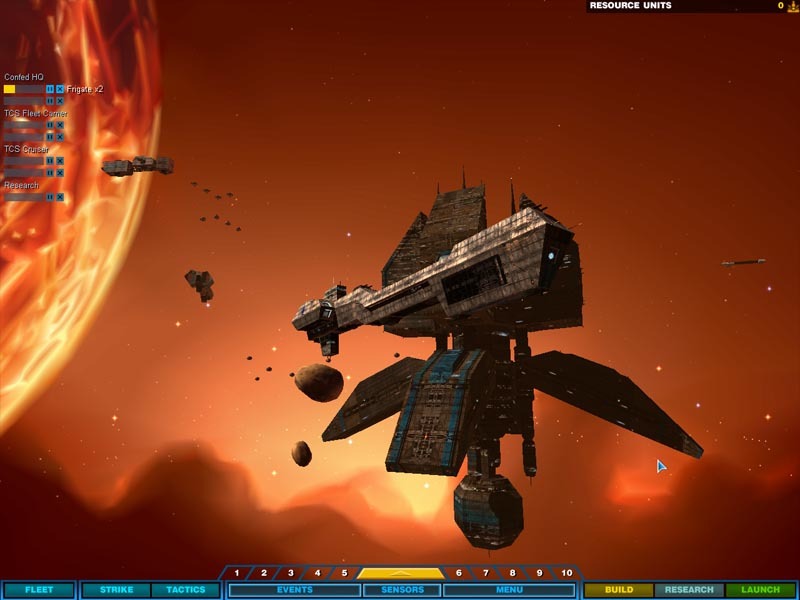 While it's not quite as popular as Eve Online or Jumpgate, Vendetta has releatively low system requirements and runs on PC, Mac and Lunix systems. Although copies on store shelves are somewhat rare these days, when you do see them they're about $10 and the developers still actively support the gameworld. 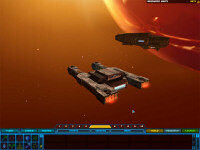 Players don't have individual characters, but they are represented by their unique ships and the various upgrades people can afford. 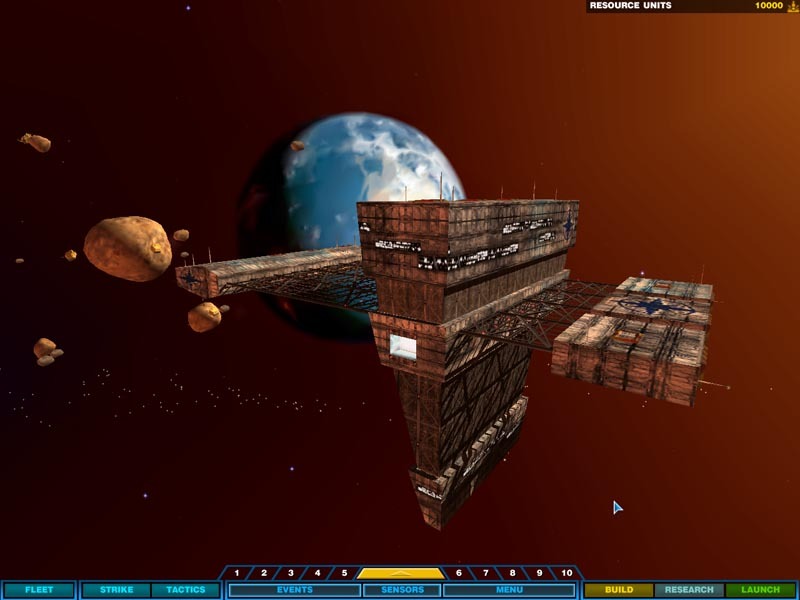 Space is nice and colorful in the game, and both atmospheric Wing Commander-style or Jumpgate-style realistic physics flight models can be chosen. A free trial is available to download and play if this sounds like your kind of thing. Here's another set of awesome advertisements from old issues of Computer Gaming World. Alkarion grabbed these from issues of the magazine published in the early 1990s. Like the last set, these are creative ads that are full of tough talking verbiage and feature original takes on familiar Wing Commander art. 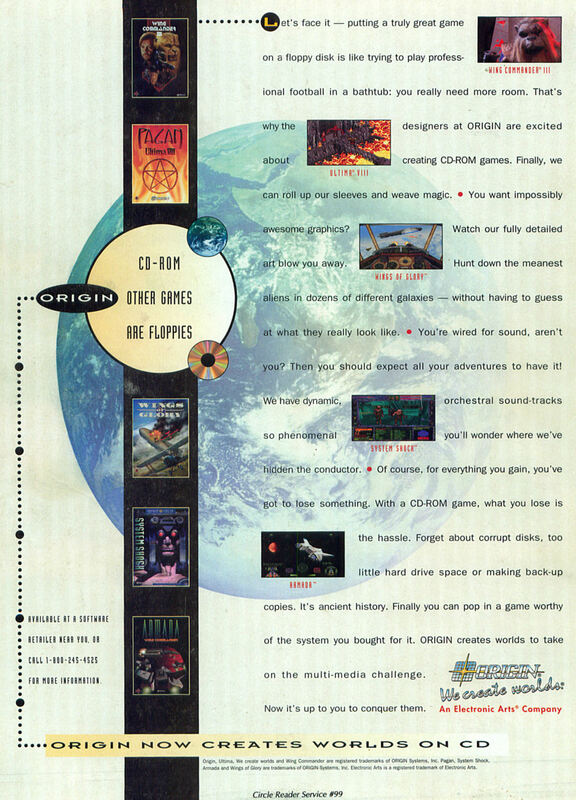 The first image is a 1992 advertisement that covered the entire series released up until that point. It's hard to imagine, but WC1, WC2 and their four add-on campaigns were all released within a two-year time span. 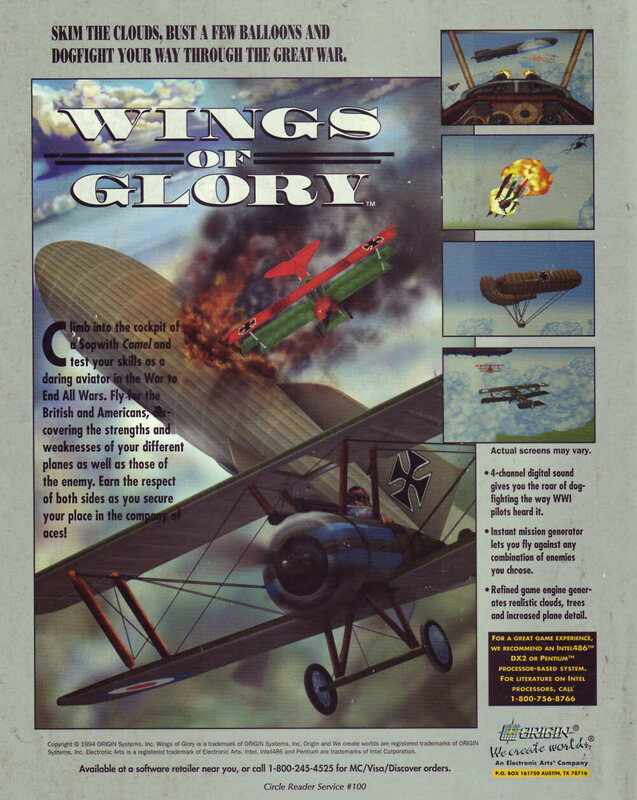 The novel Freedom Flight and ports of the original Wing Commander for the Super Nintendo and Amiga were still in the works as the second Special Operations pack rolled out of the factory. 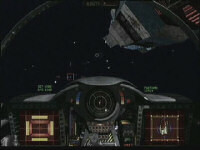 These original titles account for some 160 missions and quickly established Wing Commander as the premiere space combat simulator and interactive movie. 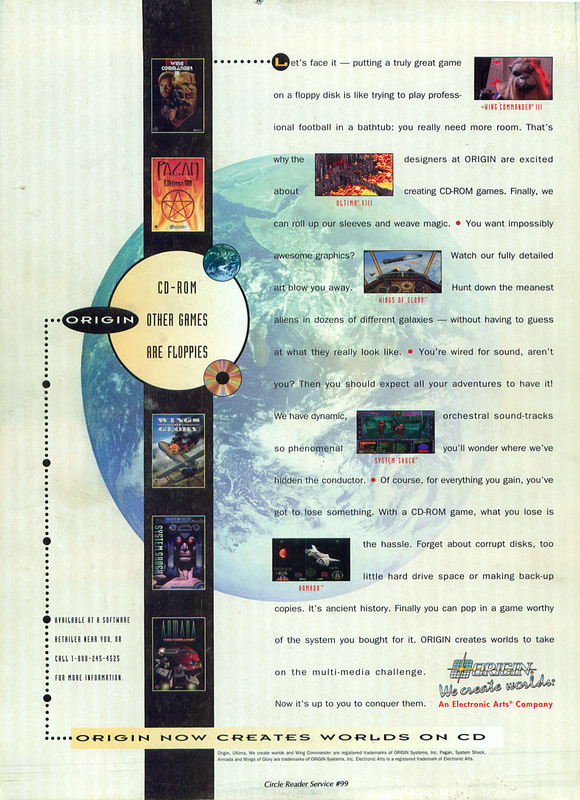 The middle strip is a Spring 1991 advertisement promoting the release of the second Secret Missions title. 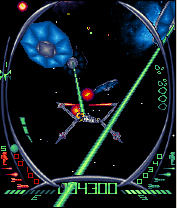 Both games in the ad pioneered the expansion disk concept and were created very quickly to seize on Wing Commander's surprise success. 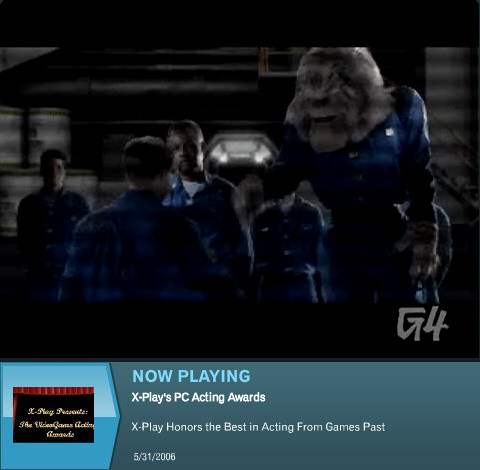 The last ad plays on the film strip concept also seen on the WC2 box. Long before Wing Commander 3's live actor FMV made its debut, the WC series was already known for its cinematic storytelling and lifelike characters. 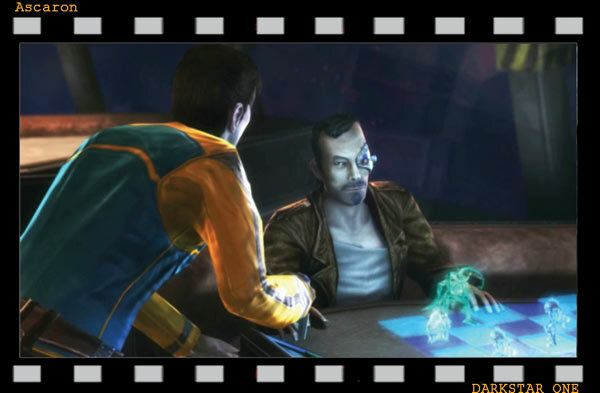 Origin emphasized this by showing scenes from the game in distinctive film reel highlights. The bullet points at the bottom also remind us just have revolutionary this all was at the time. WC2's digitized speech made Soundblaster a household name and kicked off the multimedia PC era. Last year, ORIGIN defined the state of the art in computer games... Now, we're doing it all over again. Can Furballs Really Fly? There's only one way to find out. Jump into Wing Commander, the game series that defined interactive entertainment on the PC. You're whisked to the front lines and left in the middle of an intergalactic brawl with a bunch of flea-bitten, battle-scarred felines from Kilrah. EA has cracked down on the illicit gold trade in Ultima Online this week, and new measures are in place to prevent certain exploits in the future. A whopping 15 trillion (15,000,000,000,000) gold pieces were removed from the total UO economy and almost 200 offending accounts were banned. GameSpot ran the numbers versus current prices for UO gold on eBay and determined the real world value of the seized gold to be at least US $15 million and as high as $60 million. When the developers closed a loophole that allowed people to accumulate so much gold, a number of legitimate users were affected. The instructions to tell proper players how to find their money seem hilariously complex. We realize that some of checks for amounts over one million gold were created by players who did not intend to exploit or harm the game. The vast majority of these checks have been automatically replaced with separate checks equal to the total amount of the replaced check, which can be found in a brown bag where the original check was located. If the check was inside of a container, you will find the brown bag in the same location as that container. Please note that in some cases the brown bag will be underneath the container, so you will need to move the container to access the bag. If the check was in your backpack or in your bank box, the brown bag will be located in your bank box. In some cases, this may cause your bank box or your house to hold more than their item limit. Don’t worry; the new checks are still safe! However, before you will be allowed to place anything more into your bank box or lock down an item in your house, you will have to remove enough items from your bank box or unlock enough items from your house to bring the total number of items below the item limit. In rare cases where we could not safely convert these checks, the checks were automatically placed in a red secure container with the label, “Please contact a GM about this item.” These containers will not decay, so you may page a GM at your leisure to convert the checks. Please note: If these containers reside in a house, the house owner must be present. The final price increase for DragonCon 2006 hits next week, so now's the last chance to get discounted passes before the event. Memberships are $70 until July 15, and then $85 at the door. In the last few months, the guest list has grown to include George Takei from Star Trek, Erick Avari from numerous science fiction roles and many other guests. We're also about to order tickets for some of the other Atlanta area attractions in the days leading up to the convention, so let us know if you'll be in the area and want to hang out. Each summer the CIC staff and a bunch of Wing Commander fanatics have a good time at one of the world's biggest science fiction conventions. The biggest hurdle for most people to attend are travel and hotel arrangements, so feel free to ask in our DragonCon Forum if you have questions about that. 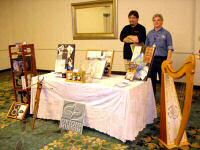 You can check out our pictures from last year here. Most of us don't pack lightly. 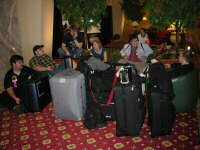 The first shot shows us circling the wagons after checking out of the hotel in 2005. LOAF is performing for the webcam in the middle picture, and the final image was a quick snap taken while we were preparing for the parade. Attendees will have a chance to meet fellow players and the developers, as well as get the inside track on future developments for the game. The Roundtable will feature Dark Age of Camelot -themed activities including LAN play (sponsored by NVIDIA and NEC Display Solutions of America, Inc.), open discussion forums with the development team, guest speakers, and contests. Players who register before August 25, 2006 will receive a beta account for the next Dark Age of Camelot expansion, a free copy of the expansion and an exclusive in-game item. Confed recently found what he thought to be a missing scene from Wing Commander 3. It turns out that there are some small differences during the argument between Hobbes and Cobra in the PC version compared to the PSX port of the game. The PC edition contains a few more sentences and the console cut is edited differently. Check out both the PC version and the PlayStation version of the scene and see what you think. 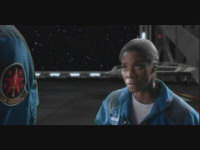 Both are encoded with divx. Thanks to TomGaines for capturing the DOS clip. 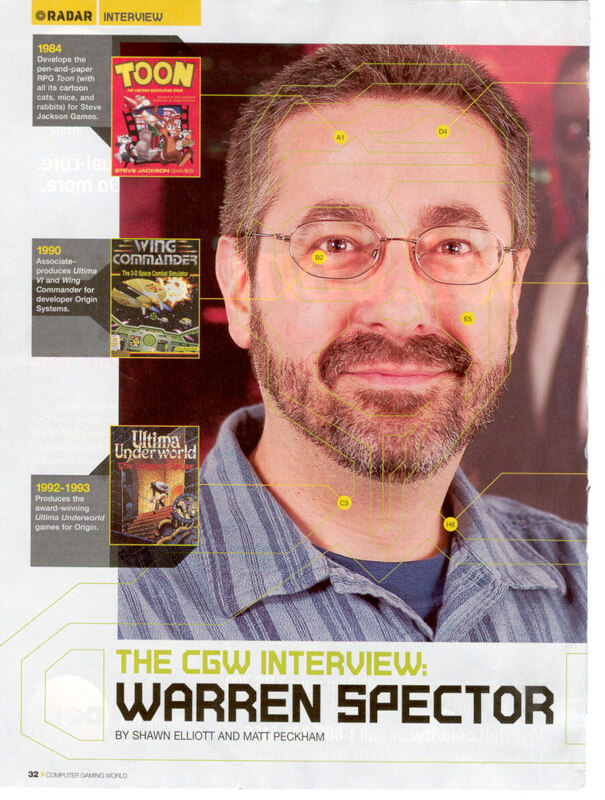 The current issue (264) of CGW magazine features an interview with Warren Spector, who was the associate producer of the original Wing Commander game. Since then Warren has become a highly influential figure in gaming, having been involved with producing games for Electronic Arts and Ion Storm. He has outspoken opinions about where the gaming industry is headed and tries to initiate some of the more creative development projects. Last year he moved on to establish his own game studio, Junction Point Studios, which is now working on producing an announced game based around Valve's Source engine. CGW: Roger Ebert recently held a debate about the much-reviled "games as art" issue, but included no acknowledged speecialists like Henry Jenkins. Does it damage the "cause" when prominent media personalities have these kinds of "disconnected" debates? WS: Roger Ebert has no impact whatsoever on the future of gaming... The fact is, almost everyone under the age of 30 grew up with games (and a lot of us over the age of 30! ), and there's no sign that gamers stop being gamers as they get older... We do need to create a wider variety of game types and offer a wider range of content, but games are here to say. Universities are starting to recognize our cultural significance. Parents are playing with their kids. It's only a matter of time before the President's a PlayStation owner. We're an art form. We've won. Get over it, Roger. 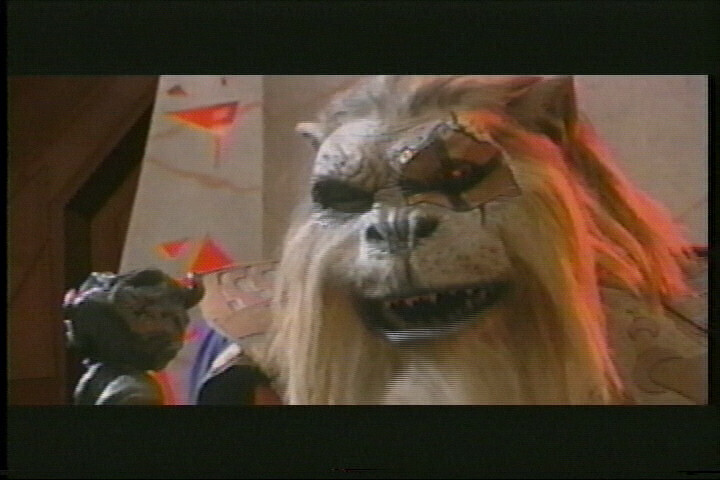 If you read nothing else, check out the Wing Commander box jacked into his eyeball. Iceblade is working on a HUD design for the Border Worlds faction in Ranger's Glory. The game is built on the Flight Commander engine; it looks and feels like Prophecy, but modding is made comparatively easy. 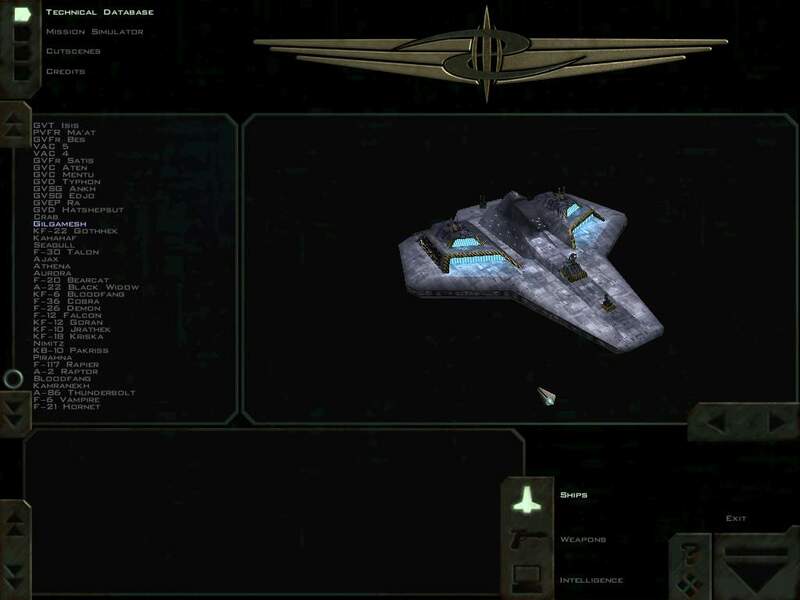 You can also look at some HUD designs for Flight Commander that Venom submitted a couple of weeks ago. Today our American readers celebrate 230 years of independence. 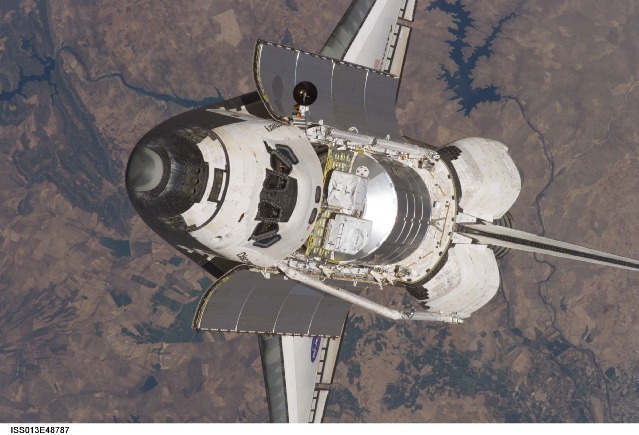 Shuttle Discovery blasted off earlier today, carrying the first European to live on the International Space Station. Happy Fourth, everyone! For those who haven't been keeping a close eye on Wing Commander creator Chris Roberts, AD came across the production notes for the recently released Lucky Number Slevin. They include an updated version of the biography posted to his Ascendant Pictures production company website. The document has various quotes about his involvement with with Slevin project and boasts about his success with the Wing Commander series. You can grab the small pdf here. Mr. Roberts is also a producer for half a dozen other projects due out over the next couple years. Expiration Date, Who's Your Caddy?, Outlander, Black Water Transit, Grounded and Seasons of Dust are all in the queue. Note that the fourth paragraph is incorrect. Digital Anvil was closed prior to publication of this biography. Chris Roberts founded Ascendant Pictures in spring 2002 and in just a short time, established himself and the company as a force in the world of independent film production and finance. In 2004, Roberts earned an Executive Producer credit on THE PUNISHER and produced THE BIG WHITE and LORD OF WAR. In 2005, Roberts served as Executive Producer on THE JACKET and the upcoming Robert Towne film, ASK THE DUST. The end of 2005 finds him prepping for two films aiming for a spring 2006 start: Neil Jordan’s historical drama, BORGIA starring Colin Farrell and Scarlett Johansson, and the effects laden sci-fi Viking project, OUTLANDER. Roberts will also serve as Executive Producer on BLACK WATER TRANSIT. Prior to founding Ascendant, Roberts was Chairman and CEO of Digital Anvil (DA), the game development and digital effects company he founded in 1996 with funding from Microsoft and Advanced Micro Devices. Roberts guided DA’s growth to annual revenues of $14 million, prior to the release of many of its games in development. His innovations changed the gaming industry. 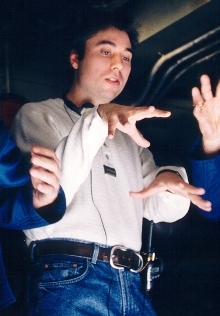 His games were the first to perfect the use of 35mm film as narrative in interactive game titles, and DA became the first interactive entertainment company to produce a game title, WING COMMANDER, into a $25 million feature film, directed and produced by Roberts. The film starred Freddie Prinze Jr., Saffron Burrows and Matthew Lillard. In 1987, Roberts joined Origin Systems, Inc. (OSI), which was later acquired as a wholly owned subsidiary by Electronic Arts (EA) in 1992 for $30 million. Roberts was instrumental in OSI’s growth from a company with $4 million in annual revenues to a company with annual revenues of $50 million. 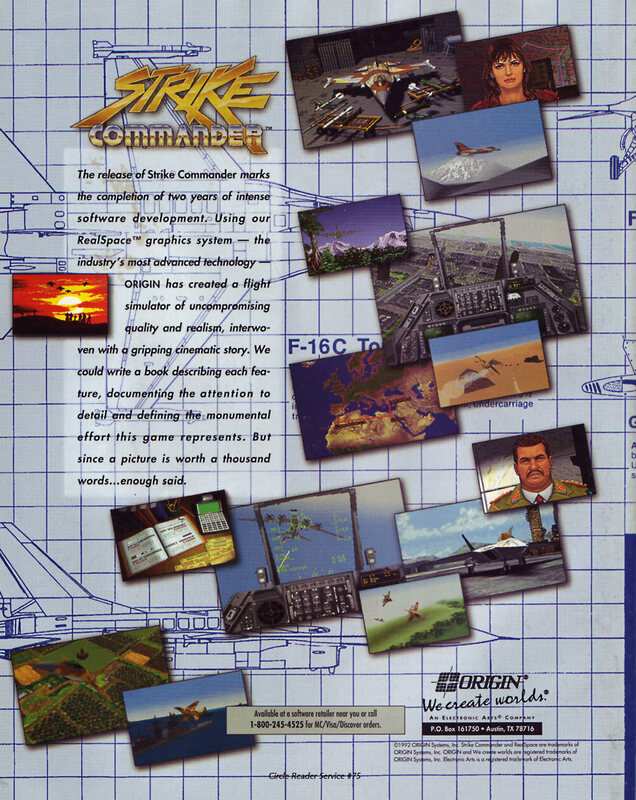 In 1990, Roberts developed WING COMMANDER, which set a new standard in PC games and evolved into a franchise series of game titles, all developed and produced by Roberts. 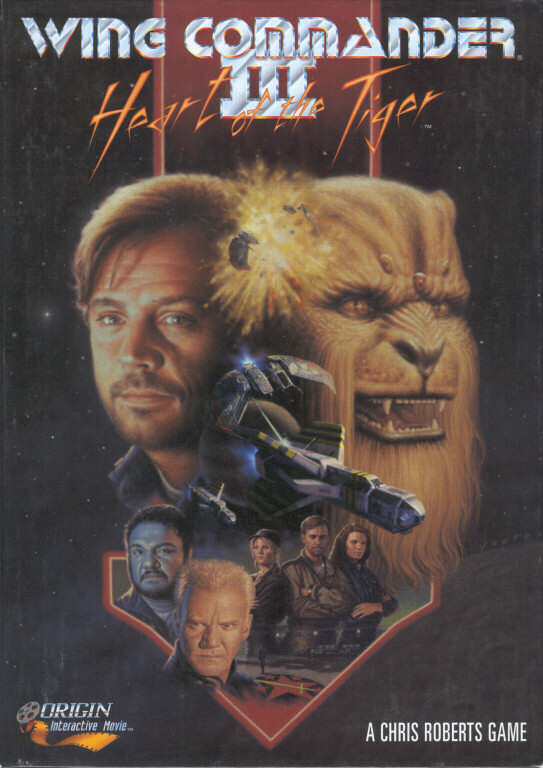 With its cinematic quality, clearly developed storylines and well-known actors, the WING COMMANDER series created a whole new genre within the gaming industry known as the "interactive movie." 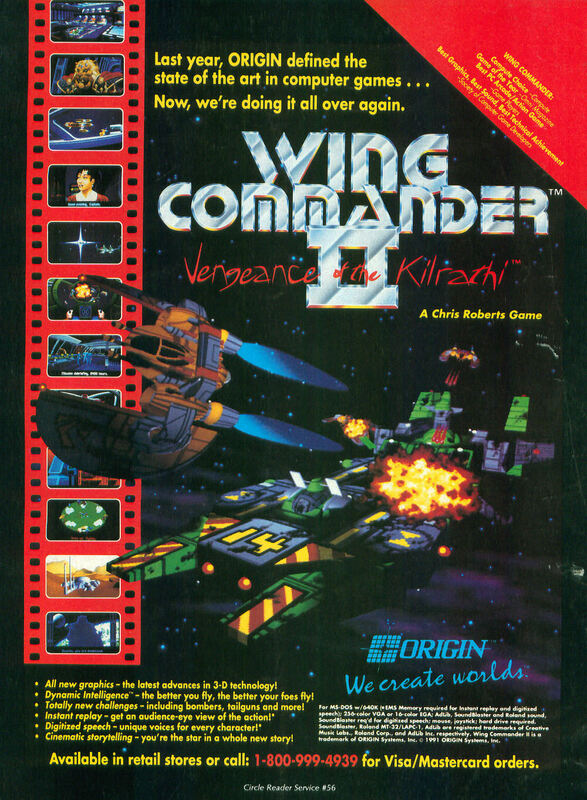 By 1995, the WING COMMANDER series had generated well over $110 million in revenues, and from 1990 to 1995, the series accounted for more than 60% of OSI’s revenue. In addition to selling more than 3 million units worldwide by 1995, the series has also won a record setting number of gaming awards. 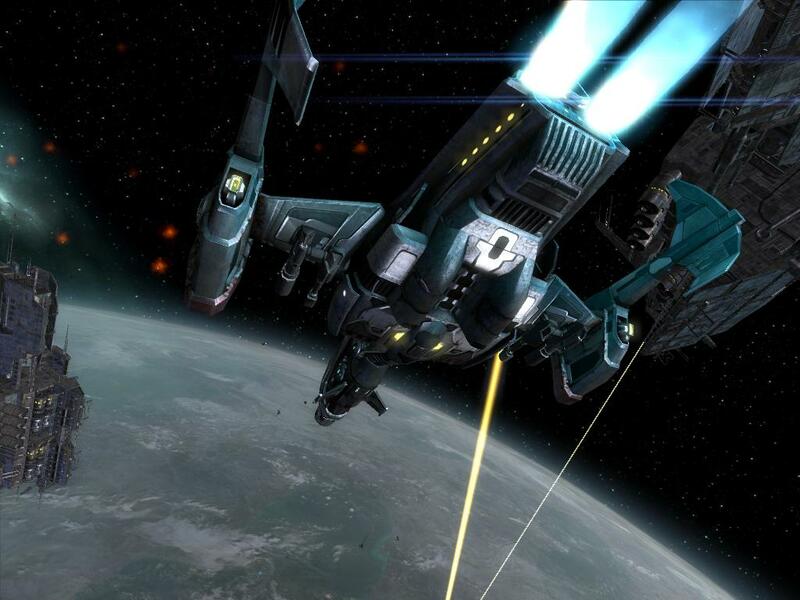 To date, WING COMMANDER has generated over $400 million in global retail revenue. 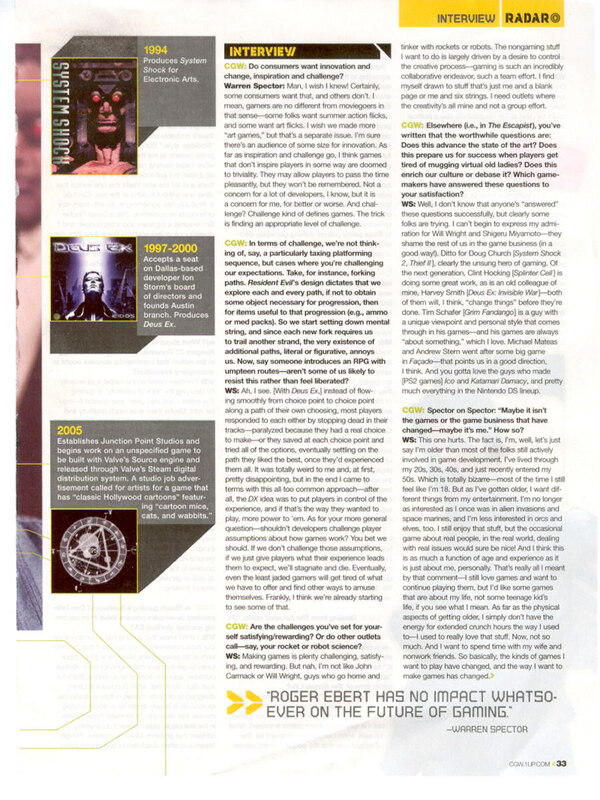 A gaming wunderkind, Roberts sold his first computer game at the age of 14, and by the age of 20, Roberts had developed three #1 hits in his native U.K.: MATCH DAY, WIZ ADORE and STRYKER RUN. It doesn't take long for EA to put people to work. It's been less than two weeks since the acquisition accouncement was made, and it already appears that personnel from EA Mythic will be joining the folks at EALA to assist with Ultima Online. This is just a simple creative partnership for now, but it sounds like the UO Live team is eager to see what sort of ideas their East Coast counterparts can come up with. These are exciting days for MMORPG fans here at EA. With the acquisition of Mythic, the UO team will be working with the creative folks who brought us Dark Age of Camelot and are hard at work on the spectacular-looking Warhammer Online: Age of Reckoning. I’m thrilled that the UO team and Mythic will work together to forge Britannia’s future. There is much to talk about with our new partners, and it will take some time to review and finalize our plans. Because we need to take that time, we are postponing the announcement that we were going to make this week. The in-game fiction cycle will take a break for a bit and will return soon. 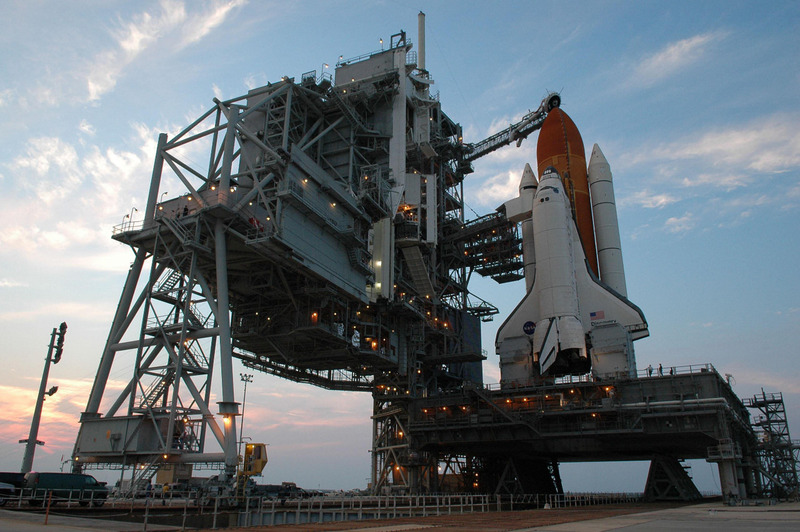 Despite some issues that were originally a concern, it seems that the Space Shuttle Discovery is still set for a July 4th launch. 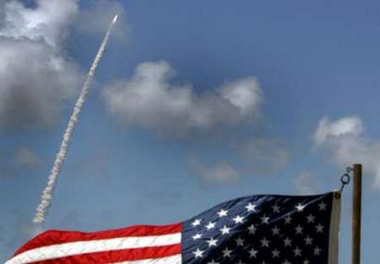 This'll be the first shuttle launch on the US Independence Day, and hopefully it goes off without a hitch. As with all events of this nature, fans are welcome to count down with us in #Wingnut. If you'll be out doing other things on Tuesday, stay safe. 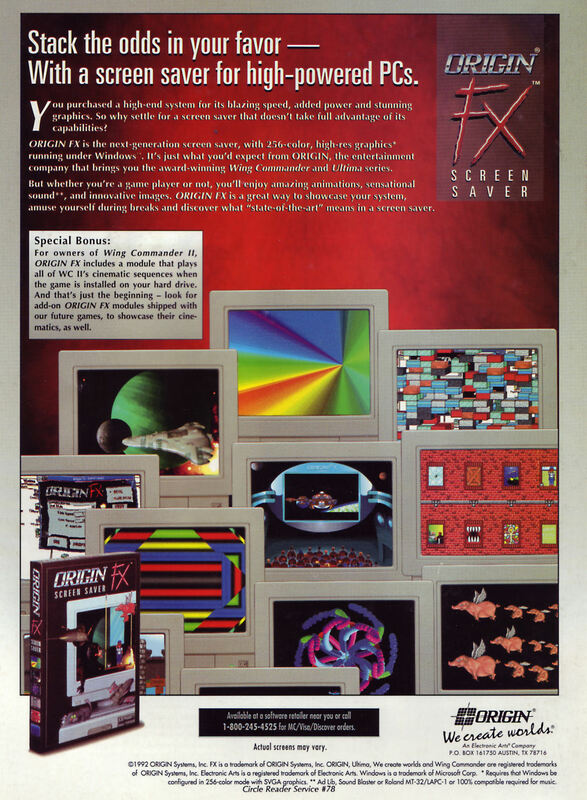 Back in the early '90s, Origin fans could look forward to advertisements, previews and special features on their favorite games in almost every issue of Computer Gaming World. Last week we posted some lost artwork that was revealed in the magazine, and even a Joan's Supplement made it out in 1991. 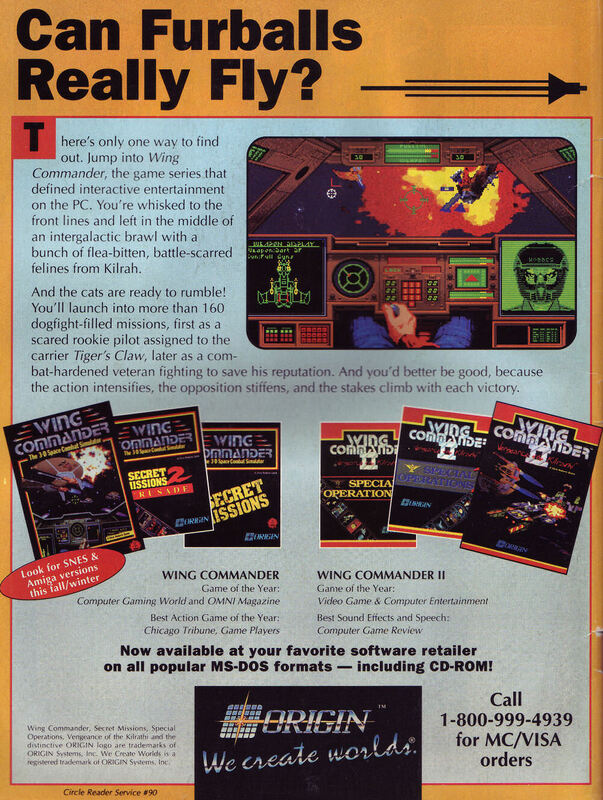 Today we have three really cool Wing Commander advertisements from the CGW back page thanks to Alkarion. Armada's artwork features the familiar Arrow, but only in this scene do they face off against a trio of heavy Gorans. Placeholder text seems to exist instead of mine, shipyard and fortress images, and the final look of the strategic map was tweaked slightly before release. Academy's sheet also has some temporary art in the form of a Morningstar schematic on the Wraith's left VDU. The Wingmen are also different from what made it to the final game. Rusty, Dingo, Gauntlet and Harridan were eventually replaced by Maniac, Hobbes, Angel and Lightspeed. 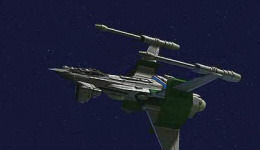 The primary fighter pictured is the Dralthi VII, which also made it to the game's box art, but not the game itself. 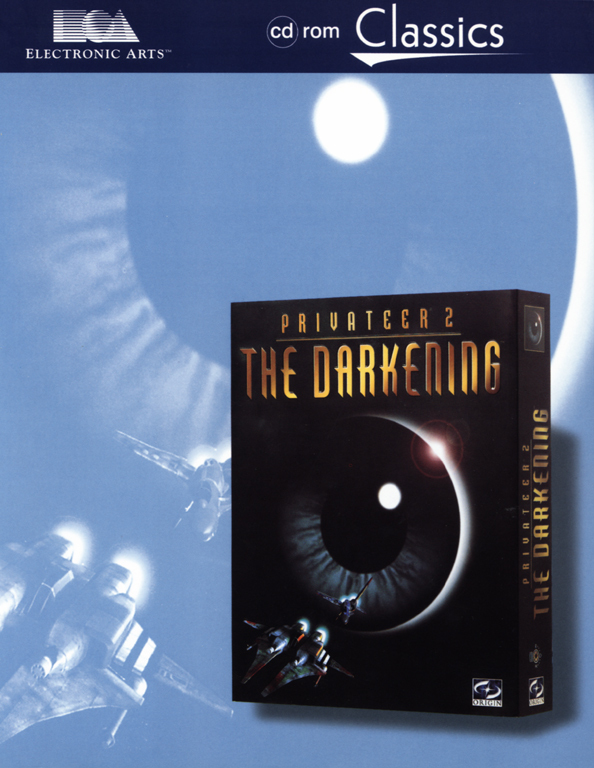 Privateer's ad also focuses on the box art with a set of mostly final screenshots. The ship dealer screen seems to be selling a Plasma Gun for a mere 15,000 credits however! They all have pretty exciting taglines and text which sets the tone for each game very well. Be sure to check out the high res links below if you really want to see the minute details. 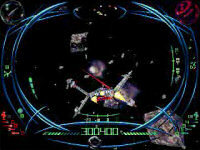 Wing Commander Armada: The life of a seasoned starfighter pilot isn't all glory and adventure. 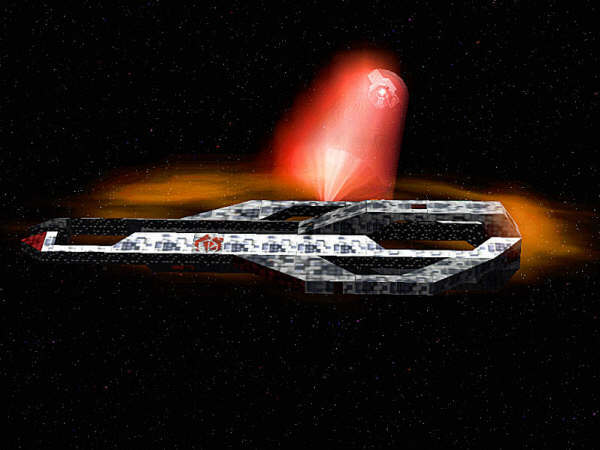 After years of following orders and losing ships and friends, you are finally the sole commander of the fleet, responsible for heading up a final strike against your enemy's homeland - either the Empire of Kilrah or the confederation. 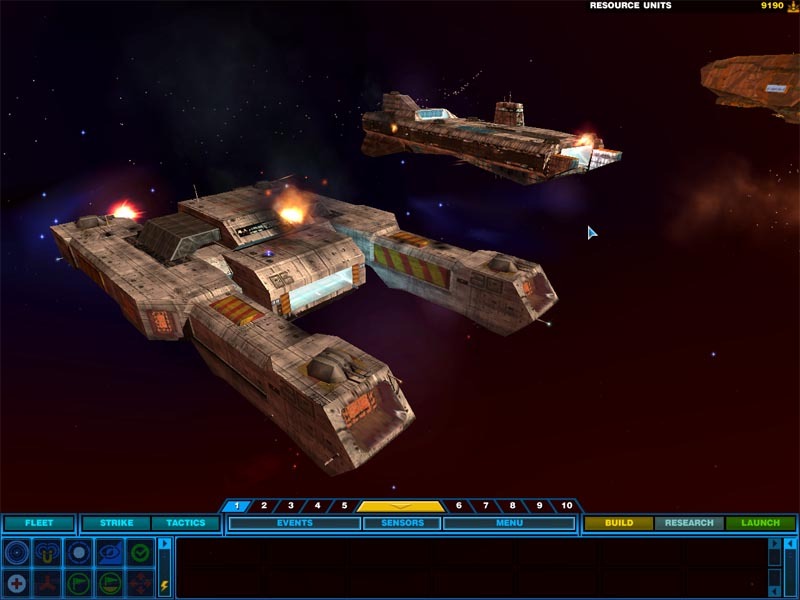 Wing Commander Academy: Relentless Space Combat - For Naive Rookies or Hardened Vets. 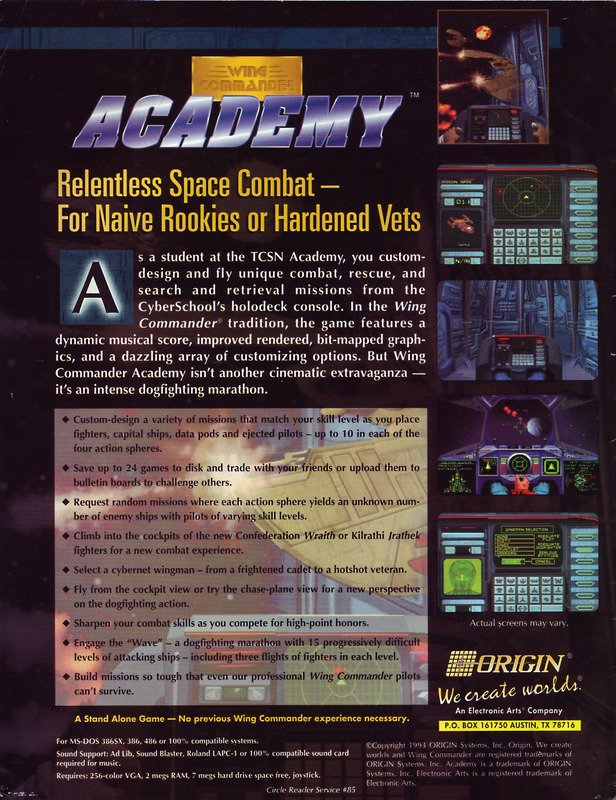 As a student at the TCSN Academy, you custom-design and fly unique combat, rescue, and search and retrieval missions from the CyberSchool's holodeck console. In the Wing Commander tradition, the game features a dynamic musical score, improved rendered, bit-mapped graphics, and a dazzling array of customizing options. 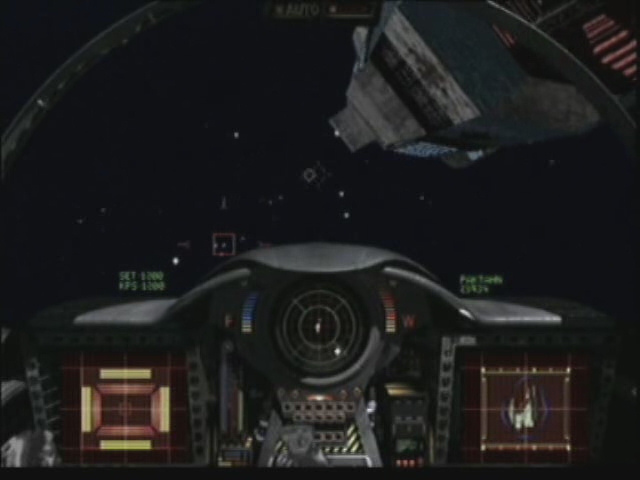 But Wing Commander Academy isn't another cinematic extravaganza - it's an intense dogfighting marathon. 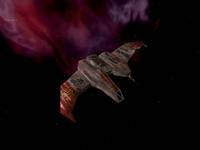 Wing Commander Privateer: The War against the Kilrathi Rages on. To some, it means death, slavery or dishonor... To others, it's the chance to make a quick buck. 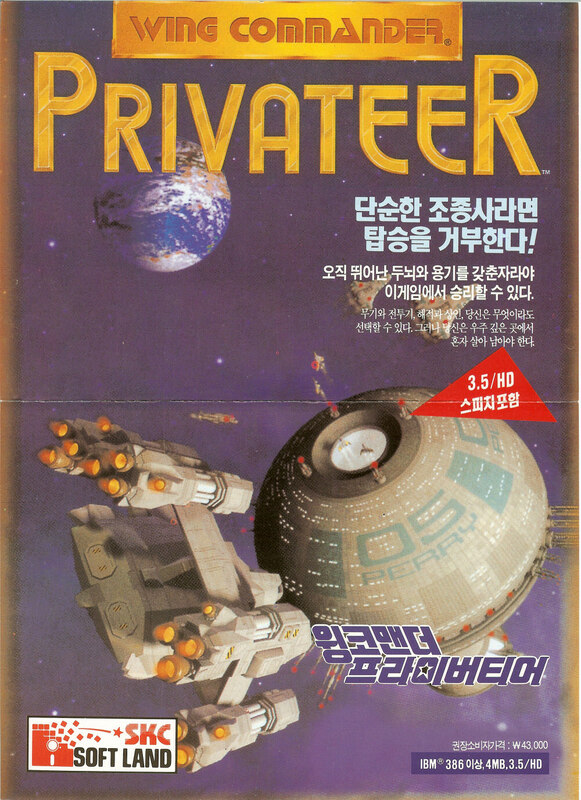 Privateer - where deals are made with a handshake and broken by a volley from a meson cannon. Our new poll asks which famous Wing Commander takeoff sequences were your favorite. There's some real classics to choose from. 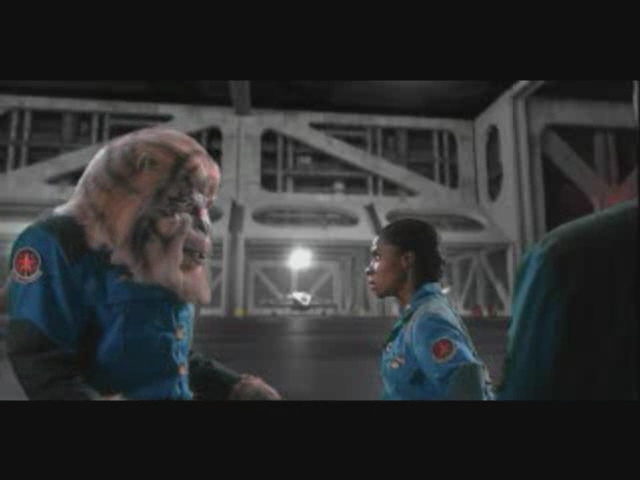 Everyone remembers the dash from the briefing from in Wing Commander 1 (grab the scramble mp3 here) or Blair scrambling down stairs in Wing Commander 3. 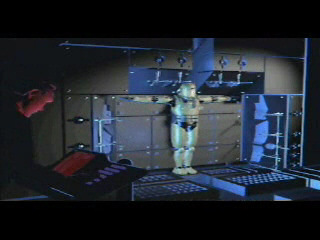 Prophecy's unique crane on rails was cool to watch, and Academy's holodeck flash was a nifty effect back in 1993. 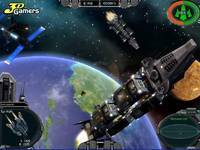 Wing Commanders 2 and 4 gave us quite a few different scrambles based on story situations, and Privateer's happy takeoff music still rings in my ears. One of the least well known, but most exotic launch scenes occurs during the robotic flight suit application process in Super Wing Commander. You can find a video of it in motion here. 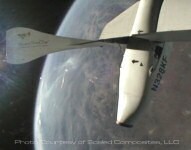 Check out the Mission Briefing & First Mission clip about about 2:12 in. Our old poll has closed, and it turns out that people liked Wing Commander 4's cutscenes the most in the series, followed closely by Wing Commander 3. 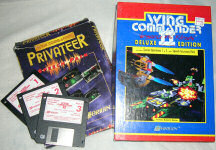 Wing Commander 2 actually managed to beat out Prophecy, and Wing Commander 1 even passed Privateer 2. It appears that live actors and real sets aren't all that matter to people. 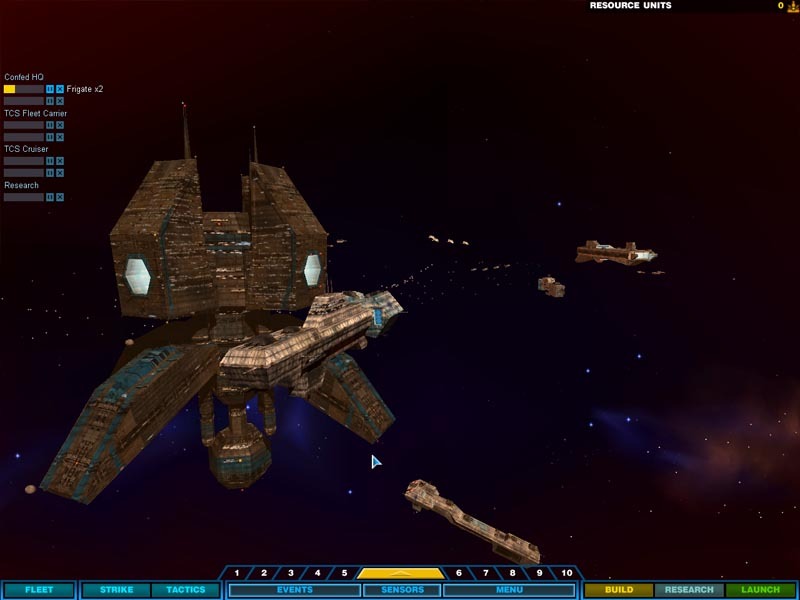 Impressive progress continues to be made on the upcoming WC4 Homeworld 2 mod. The Durango Class Light Carrier has been added to the fleet, and it looks great. Check out the images of it ripping stuff up and taking hits below. Most carriers are big vulnerable boxes without their fighters though, and Aaron Thomas has fixed this by adding all the Border Worlds fighters. The new Vindicator was the last one left. A cute little UBW satellite drone also made the cut, and it looks like it has some teeth too. Aaron is now working on sound effects for the project. I have been hard at work on an aspect of the mod that I can not post updates about in the usual fashion. As of last night all fighters have full WC sound, weapon fx and weapon sound fx. It feels so good to hear some familiar audio, and I can definitely tell you it's taken the feel 'up a notch'! I would like to thank Stefan, my friend over at the HW2 forums, for his valuable time and help on getting the fx started. He was kind enough to donate me a few files to help me understand the process and get the fx overhaul underway. Going to spend tonight coding the respective damage capacity of each specific weapon into the mod. I'll try to post a few pics, though gunfire is an effect to be heard and seen in realtime to get the actual feeling. 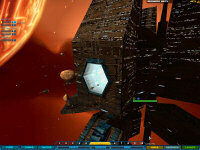 On Friday, GameSpot premiered the demo for Darkstar One. 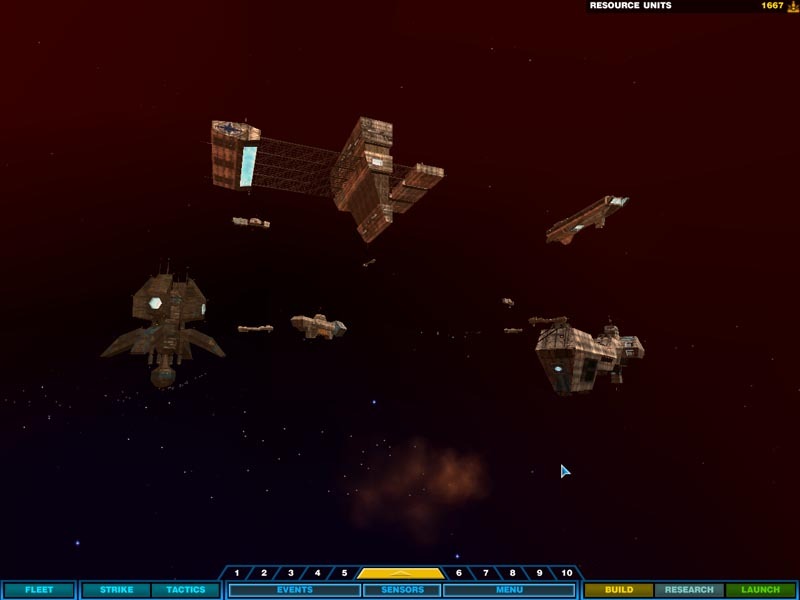 The game is a space combat sim that we've mentioned in the news several times, because of the number of previews have compared it to Wing Commander. With this publicly available try-out, you can now see for yourself. GameSpot's video preview mentions Wing Commander quite a bit and demonstrates the gameplay in detail. 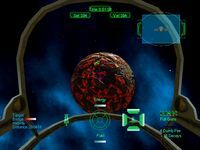 Both commentators in the clip lament the absence of joystick support, but they're not surprised that a modern space sim such as this has built itself around more popular control schemes in 2006. Nevertheless, players seem to have slightly more control over flight than in Freelancer, and the graphics and art style seem fairly sharp. 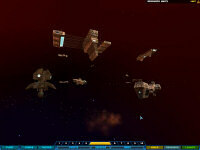 Space sim fans should try out the demo here (950 megs). Thanks to Charles Hall and music_guru/Goliath_GG. 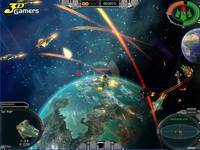 A new entry in the space-combat genre isn't an everyday occurrence. 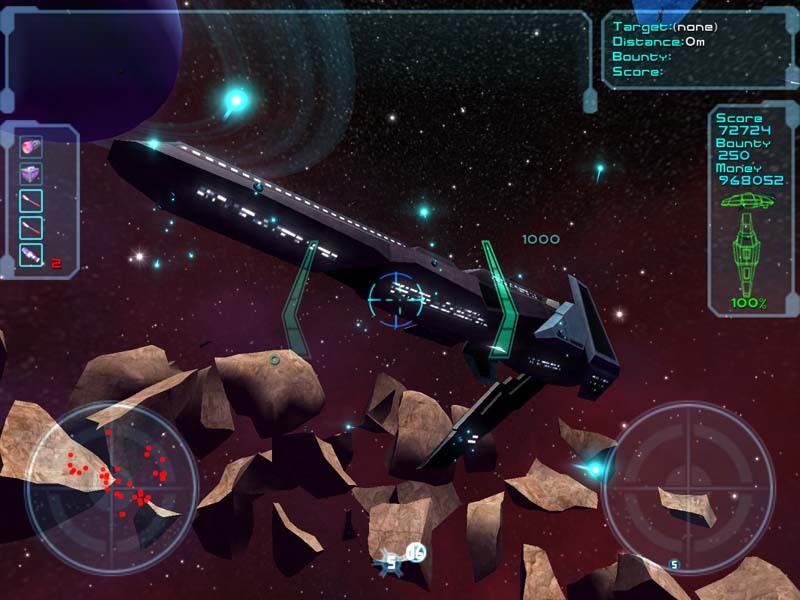 DarkStar One is a modern update on the old-school space combat and adventure game that used to be a staple on the PC a decade ago, with games such as Wing Commander: Privateer. 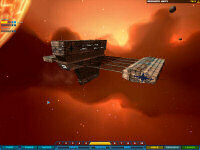 And like in that game, DarkStar One lets you fly around the galaxy in a customizable spaceship, battling pirates and other foes while also buying and selling on the open market. Edit: t.c.cgi let us know that joystick support is actually included. Just enabled it in the options menu first. 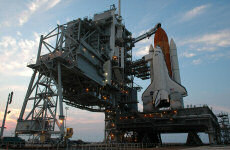 A storm near Florida has delayed the space shuttle launch until at least Sunday. The new prosed liftoff time is now 3:26 pm Eastern time. Feel free to drop by #Wingnut and count down with us. And if you're browsing CNN looking for shuttle news, apparently we now have to watch out for real live flashpaks.